ANCHORAGE, AK – The action was fast and furious, dramatic and even controversial, in the always exciting classic sprint event on the second round of racing at the 2019 U.S. Ski & Snowboard Cross Country Junior National Championships on Wednesday at Kincaid Park. Six national champions were crowned, including Alaskans Gus Schumacher (U20 men/Alaska Winter Stars) and Kendall Kramer (U18 women/Fairbanks XC), who each won their respective freestyle races on Monday’s opening day. Schumacher’s win in the U20 final was unconventional. J.C. Schoonmaker’s (UAA/Far West) powerful poling and last-second lunge overtook Schumacher at the finish of the final, but officials later ruled that he violated the classic technique rules. The ruling moved Schumacher into first. Alaska’s Michael Earnhart (Alaska Nordic Racing) had a surprising victory in the men’s U18 race, winning by nearly four seconds. New England teammates and longtime friends and rivals Aiden Burt (Mansfield Nordic) and Trey Jones (Green Mountain) fought to the finish in the U16 final, with Burt holding on for a tight win. In the women’s U20 final, Anja Maijala (UAF/Alaska) redeemed herself with a win at Kincaid Park after an injury here two weeks ago. In the most thrilling finish of the day, Kramer gutted out a come-from-behind win in the U18 final, edging Sarah Morgan (Sun Valley SEF/Intermountain) by .6 seconds. Logan Smith (Sun Valley SEF/Intermountain) finished the day with a three second win in the women’s U16 final, despite having her left boot partially come apart. Wednesday’s course covered a short-but-far-from-sweet 1.4 kilometers. It started immediately up the steep Gong Hill, then meandered a roller-coaster of small bumps and curves, then shot back down the Gong Hill to a long, tough corner at its bottom that led into the stadium. Skiers then quickly disappeared from the stadium again to hit a 180-degree corner before returning just as quickly on a short uphill/flat stretch to the finish line. Anchorage’s current spring freeze-thaw weather cycle created icy conditions which made the tracks, and even the corduroy, super slick. It enabled skiers to aggressively double-pole, even up portions of hills, but was also the cause of a handful of crashes, near misses, snapped poles, and at least one shredded ski. Even during the qualification rounds, many skiers lost control on the big downhill and tight corner, spinning and crashing. Those who stayed upright posted fast times – the top men flirted with breaking the three-minute barrier, while the top women scorched the course in under four minutes – and faced tough technical skiing, as officials on the course ensured skiers maintained the classic technique. Wednesday was a sprint format, which creates intrigue on the trails and excitement at the finish line. But for many, the experience is also a marathon. Those who advanced to the finals had to survive four rounds of racing: qualifying, in which they hit the course individually, starting in 15-second intervals, followed by six-skier head-to-head group racing in the quarterfinals, semifinals and finals. Depending on their division, it was a grueling 4-5 hours between the qualifier round and the finals. There were five quarterfinal heats in each age bracket, with the two fastest skiers in each advancing along with two “lucky losers” (the two fastest skiers that didn’t finish in the top two of their heat) into the two race semifinals races of 12 remaining skiers. The same format held in the two-race semis, with the top two skiers from each heat advancing to the finals along with two lucky losers. U20 men classic sprint The upset of the day bit both skiers as the dramatic finish was negated 20 minutes after the event when officials ruled that Schoonmaker violated the classic technique in the course’s finish zone. The decision made Schumacher the winner and national champ, but it was an outcome that neither skier was content with. In that final, Schumacher held a slim lead coming down the Gong Hill, with Schoonmaker, in a tight tuck, quickly gaining. When the pair emerged onto the flat, 75-meter long finish area, Schoonmaker had made up nearly all the distance. The two powerful skiers dueled in a lung-and-leg busting, double-poling finish, with Schoonmaker finally passing Schumacher with a big thrust of his boot at the finish line, seemingly winning by a toe. Schoonmaker’s team protested the sanction. After the day of racing concluded, officials ruled the sanction a “competition suspension” which relegated the skier to sixth in the finals. Schoonmaker and Schumacher met after the podium ceremony, both smiling while talking about the awkward ending. “You want some cinnamon roll?” Schumaker asked. Schoonmaker accepted. U20 women classic sprint Two weeks ago, the Gong Hill defeated Anja Maijala. Wednesday, it propelled her to a national title. Maijala separated her shoulder in a fall on the hill two weeks ago. Still sore in both shoulders, she was unsure if she’d race Wednesday. She felt good enough to start and steadily advanced, saying she strategically matched the output of her competition in each heat with just enough energy to keep moving forward. In the final, she charged up the Gong Hill, past the spot where she recently fell, and took a lead she’d never give back. Her speedy yet controlled downhill left no doubt as she pulled increasingly further from the pack. “I knew if I got the lead up the first hill, I’d be in good shape because my skis were rockets on the downhill,” she said. Her 3:49.97 finish gave her a win of more two seconds over Aubrey Leclair (APU/Team Alaska) at 3:52.67. Lucinda Anderson (Loppet Nordic Racing/Midwest), who won Monday’s U20 5K freestyle, finished third at 3:54.96. A group of 36 skiers finished the qualifier round of the U20 field. Maijala said her shoulders were numb after racing, but she the felt great about her Gong Hill redemption and win. U18 men classic sprint No one was more surprised with Michael Earnhart’s three-second finals win and first Junior Nationals title than the skier himself. After a solid qualifier round, which had 91 finishers, Earnhart inspected the tracks on Gong Hill. He found the popular inside classic tracks thrashed, so he made a strategic decision to use the outside track, despite its far-off position, because it was in great shape. The daring call paid off as he came down the Gong Hill with a nice lead that he held to the end. “I figured out that line, stuck to it, and that’s what got me the win,” he said. Earnhart clocked a 3:12.48 for the win, with Zanden McMullen (APU/Team Alaska) second in 3:16.18 and Johnny Hagenbuch (Sun Valley SEF/Inter-Mountain) third in 3:16.87. Hagenbuch was the top U18 skier in Monday’s U20/U18 10K freestyle; he finished second overall to Schumacher. U18 women classic sprint Kendall Kramer is a confident and ferocious competitor, though a somewhat diminutive skier, which can be a disadvantage when battling taller and bigger bodies in sprint racing. But Kramer also knows what her body is capable of and what her skiing strengths are. So she wasn’t worried in Wednesday’s final when she was passed by two skiers on the first hill after she slipped – she quickly caught and passed them. And she didn’t freak out when she later lost her lead to the taller Sarah Morgan, who cruised by Kramer on the steep downhill. With a cold crowd suddenly coming to life with cheers and cowbells, Kramer knew they both had 70 meters of double-poling ahead of them. Employing her crazy-quick double-poling cadence, Kramer caught and passed Morgan with about 30 meters to go, and then even put a little distance between them as she put a stamp on her win of the day’s most exciting race. “The tall girls got the advantage on me on the downhills, but I knew if it came down to double-poling I’d beat them,” Kramer said. Indeed she did, posting a 3:50.71 to Morgan’s 3:51.37. Charlotte Ogden (Stratton Mountain School/New England) was third at 3:52.01. 83 skiers finished the qualifier round. U16 men classic sprint Aiden Burt and Trey Jones are longtime friends and competitors in Vermont, so they know each other’s skiing and psyche well. When it came down to the flat 75-meter finish of their finals event, with Burt holding a slim lead, each knew what they had to do to win. The taller Burt maintained a double-pole in the lead; Jones suddenly switched to a speedy classic kick and gained on his friend. In the end, Burt’s burst finished off his friend by half a second (3:25.90 to 3:26.42). They might have different styles and strengths, but they both agreed that it was pretty cool to face off for a national title in Alaska, far from their home trails. “It was awesome,” Burt said. Wally Magill (Steamboat Springs/Rocky Mountain) was third at 3:33.12. It was Magill’s second podium in two races; he won the U16 5K freestyle on Monday. 73 skiers finished the qualifier round. U16 women classic sprint Even a blown-out boot couldn’t stop Logan Smith from blowing out the competition in her final. As she climbed the Gong Hill, she felt something “weird,” and thought her ski binding broke. She was wrong – it was the toe of her left ski boot ripping away from its plastic binding track, an experience avid Nordic skiers call a “delam,” short for delamination. The boot didn’t play a factor in her awesome downhill, which provided the separation that allowed her to manage a steady kick, glide and stride into the finish. After the race, teammates, friends and even strangers had to get a look at the busted boot. Smith won with a 3:49.96, followed by Quincy Massey-Bierman (Craftsbury Nordic/Inter-Mountain) at 3:53.32 and Ava Thurston (Mansfield Nordic/New England) at 3:54.19. Smith said fatigue was a bigger factor than the boot – her final was the last race in a day that started with her qualifier round nearly six hours earlier. 74 skiers finished the qualifier round. Find full race results at www.superiortiming.com/2019/03/us-cross-country-junior-nationals-2019/. Find a full schedule – race days and off-days – at www.juniornationalsxc2019.com/event-info/. Event course maps are available at www.juniornationalsxc2019.com/course-maps/. The races are livestreamed at by U.S. Ski & Snowboard at https://livestream.com/engagelivetsream/xcjuniornationals2019 and will be shared on www.facebook.com/xcjrnats2019. Results from every race will be posted in real time at www.superiortiming.com/2019/03/us- cross-country-junior-nationals-2019/, and later at www.juniornationalsxc2019.com/results-media/ and www.facebook.com/xcjrnats2019. A complete event program, which includes team rosters and race course maps, is available on PDF at www.juniornationalsxc2019.com/event-info/ and in hard copies in limited number at Kincaid Park. Racer registration is available at www.superiortiming.com/2019/03/us-cross- country-junior-nationals-2019/. There are media working areas with electricity and internet access available upstairs in the Kincaid Park chalet. If working media has questions or needs, please contact Josh Niva, Chief of Media, at nordicskiereditor@gmail.com or (907) 301-5287. For more event, race, team and athlete information, bookmark www.juniornationalsxc2019.com and www.facebook.com/xcjrnats2019. 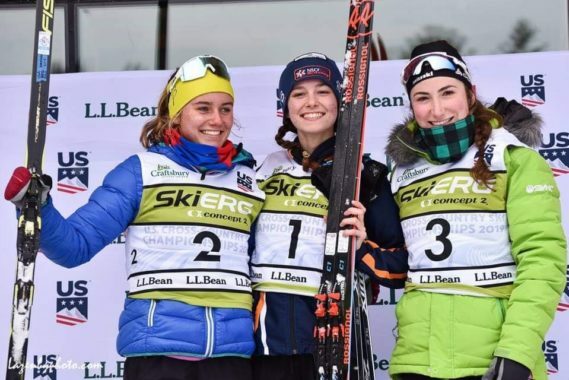 ANCHORAGE, AK – The podium was packed with young skiing stars as six national champions were crowned in the first day of racing, the individual freestyle, at the 2019 U.S. Ski & Snowboard Cross Country Junior National Championships Monday at Kincaid Park. Anchorage’s Gus Schumacher (U20, Alaska Winter Stars) continued his dominant season with a 10- second win and a national title in the men’s U20/U18 10K race; Johnny Hagenbuch (Sun Valley SEF/Intermountain) finished second behind Schumacher, and was the first U18 finisher, earning him that national title. Wally Magill (Green Mountain/New England) put up a strong 12-second win in the speedy U16 5K event. 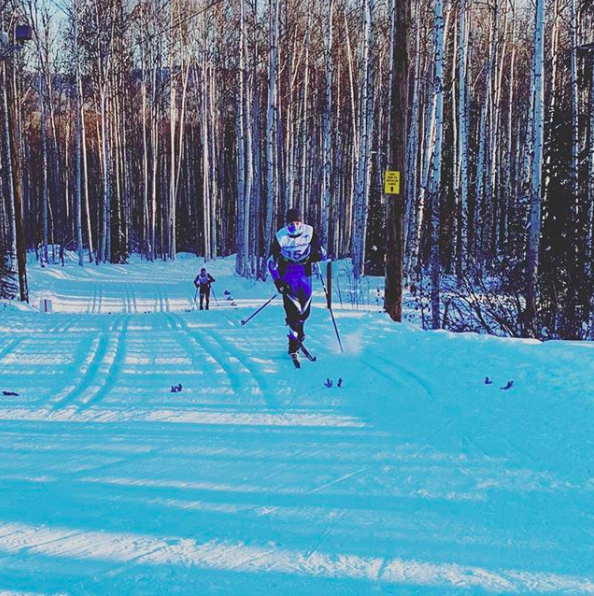 Alaska’s Kendall Kramer (U18, Fairbanks XC) kept her magical season rolling with a win in the women’s U20/U18 5K race; Lucinda Anderson (Loppet Nordic Racing/Midwest) finished second behind Kramer, and was the top U20 finisher. Haley Brewster (Ski and Snowboard Club Vail/Rocky Mountain) notched her first Junior National title with a four-second win in the U16 5K event. Monday’s individual freestyle racing had an interval start format, with skiers leaving the starting line one at a time in 30-second increments. The fan-friendly 5-kilometer roller-coaster course wove in and out of all corners of the Kincaid Park stadium area. The U20/U18 men skied the loop twice for their 10K event, while all other racers covered the course once. The day was warm, windy and a little wet, with sprinkles of rain at times. The constant wind slowed skiers in some stretches, then pushed them ahead in other; the warm weather created sticky and slick course conditions. U20/U18 men 10K individual freestyle There are probably few skiing secrets between the top three finishers in the U20/U18 10K freestyle event. 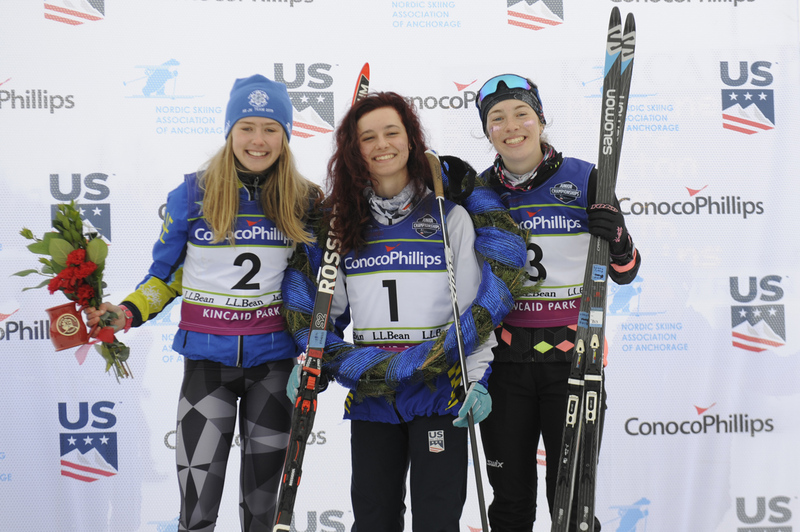 In January, Schumacher, Hagenbuch and third-place overall finisher Zanden McMullen (U18, APU/Team Alaska) were teammates representing the U.S. at the FIS Junior World Cross Country Championship in Lahti, Finland. They know each other, and one another’s skiing, well. So it was no surprise that Schumacher won Monday’s race, given his impressive season, his home course advantage, and his emergence as America’s top junior skier. Schumacher finished in 22 minutes, 48.2 seconds, topping Hagenbuch by more than 10 seconds (22:58.9). McMullen was third at 23:24.7. 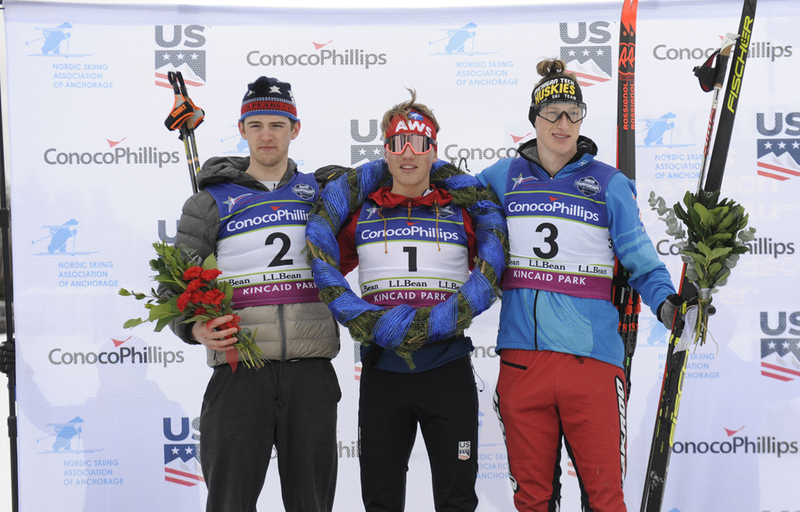 Ben Ogden and Luke Jager – was the best result ever for American men at Worlds. (Schumacher was also a member of the silver medal team at the 2018 Worlds, which was the first-ever Worlds medal for U.S. men.) Schumacher also posted the best individual finish ever by an American male at the 2019 Worlds, finishing fourth in the 30K classic. Monday, the U.S. teammates were facing off and it was Hagenbuch who set the pace, posting the fastest time in the first 5K lap – 11 minutes and 7.8 seconds, 4.1 seconds ahead of Schumacher. Schumacher dropped the hammer in his second 5K, making up the time in part by using the wind and downhills for recovery and then powering over up-hills and through the flats. And he did, crushing a fantastic final 5K that netted him the win over Hagenbuch. Shortly after they finished their respective races, the two were back to being pals. “Johnny’s a great teammate and a great competitor,” Schumacher said, nodding at his friend as they hung out after the race. McMullen was also grinning, finishing third overall and second in U18. The field in the U20/U18 race consisted of 135 skiers. The top three U20 finishers were Schumacher, Scott Schulz (Sun Valley SEF/Mid-Atlantic; fifth overall at 23:52.9) and Reid Goble (Michigan Tech/Great Lakes; sixth overall at 23:56.6). The top three U18 finishers were Hagenbuch, McMullen and Will Koch (Stratton Mountain School/New England; fourth overall at 23:30.7). U20/U18 women 5K individual freestyle Alaska’s Kendall Kramer (U18, Fairbanks XC/Team Alaska) showed off the skill, fitness and aggressiveness of a skier who scored a fourth-place finish at World Juniors in January, was crowned Alaska’s high school Skimeister for a second straight season in February, and posted a dominant Junior Nationals win on Monday, taking the 5K national title in the women’s U20/U18. Kramer, from Fairbanks, threw down a 13:09.7, topping second-place finisher Lucinda Anderson (U20, Loppet Nordic Racing/Midwest) by 26.6 seconds. Mara McCollor (U20, Minneapolis Ski Club/Midwest) was third, just behind Anderson at 13:37.1. She displayed her all-around aptitude Monday. Already strong on hills, she said her work on becoming better on the flats came together as she powered around the Kincaid Park stadium portions of the course. “I want to be a really well-rounded skier,” she said. Anderson said she was proud of her approach to Monday’s interval start, mixing consistency with pushing herself, all while trying to chase down whoever was in front of her. Monday, Anderson found a tough rabbit to chase: starting 30 seconds ahead of her was the speedy Sophia Laukli (U20, Stratton Mountain School/New England), who finished fourth overall and third in U20. That pace and chase led Anderson to her first Junior National title. “It’s pretty awesome,” Anderson said with a big smile. The field in the U20/U18 race consisted of 116 skiers. The top three U20 finishers were Anderson at 13:36.3 (second overall), followed by McCollar at 13:37.1 (third overall) and Laukli at 13:46.2 (fourth overall). The top three U18 finishers were Kramer at 13:09.7, Nina Seemann (Stratton Mountain School/New England) at 13:52.1 (sixth overall) and Libby Tuttle (Loppet Nordic Racing/Midwest) at 14:08.4 (eighth overall). U16 men 5K individual freestyle Wally Magill (Steamboat Springs Winter Sport/Rocky Mountain) cashed in a season of sweat equity Monday. He posted a 12-second national title win in the men’s 5K U16 race with a 12:31. Trey Jones (Green Mountain Valley/New England) was second at 12:43.2, barely edging Adrik Kraftson (Loppet Nordic Racing/Midwest) at 12:43.3. The race featured a field of 72 finishers. U16 women 5K individual freestyle Before Monday’s racing, Haley Brewster (Ski and Snowboard Club Vail/Rocky Mountain) allegedly spilled all of her team’s glitter before it could be applied for sparkling spirit. “I spilled some of it, not all of it!” she said rolling her eyes as her teammates, all with glitter on their red, wind-blown cheeks, laughed nearby. However, Brewster held a firm grip on the women’s U16 5K race, winning her first Junior National title with a 14:15.1, nearly five seconds ahead of Sofia Scirica (Cambridge Sports Union/New England) at 14:19.8. Molly Moening (Minneapolis Ski Club/Midwest) was third at 14:23.9. The podium moment was a great way to end the day for all three racers – it was Brewster’s first JN win while it was Scirica and Moening’s first JN race, respectively. The race had 72 finishers. Brewster said the win was “unexpected but exciting,” and that it was all set up by her focus on the course’s rolling hills, which were faster than she anticipated. “Hopefully this sets the bar for the rest of the week,” she said. U20/U18 boys, 10 a.m. start; Finals: 1 p.m.
U20/U18 girls, 10:45 a.m. start; Finals: 2:35 p.m.
U16 boys, 11:25 a.m. start; Finals: 4:15 p.m.
U16 girls, 11:50 a.m. start; Finals: 4:15 p.m. The races will be livestreamed at by U.S. Ski & Snowboard at https://livestream.com/engagelivetsream/xcjuniornationals2019 and will be shared on www.facebook.com/xcjrnats2019. Note: FasterSkier is accepting submissions for regional race reports, including for juniors racing. If you would like to see a particular race circuit covered and have the writer with the will to do it, please have them email info@fasterskier.com. Be sure to include a link to results, and preferably a few original race photos with proper credits. FAIRBANKS, Alaska — Just how cold was it for Saturday morning’s classic sprint qualifiers at Besh Cup 5, the penultimate race of the six-race qualifying series for Team Alaska? It was so cold that race organizers created a WhatsApp group to keep coaches and racers apprised of potential schedule changes from the race jury if things warmed up too slowly and race starts had to be delayed. 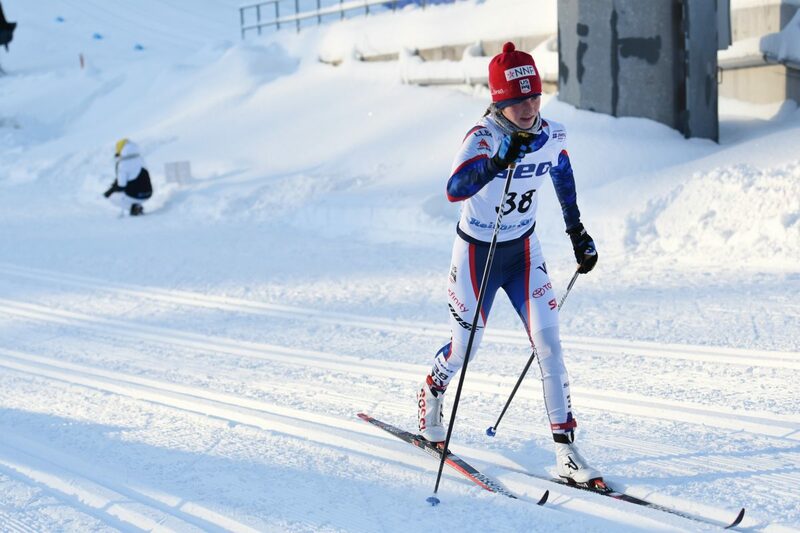 It was so cold and the snow was so slow that Fairbanks local Kendall Kramer, recently fourth in the world in a World Juniors classic race, took nearly five minutes to cover a 1.6-kilometer sprint course – and qualified second. It was so cold that racers were throwing up from the shock of sprint pace efforts in these temperatures. It was so cold that the next day it was 4 above and snowing, and everyone was happy that the fresh snow had made things so much faster. It was pretty cold. But cold in Fairbanks in February is unremarkable, and so are Fairbanks racers winning in Fairbanks. At the end of a long, trying, and, yes, cold day of sprint racing Saturday afternoon, the overall men’s podium was a clean sweep for the Golden Heart City: Fairbanks native and former University of Alaska Fairbanks (UAF) skier Logan Hanneman in first, current UAF skier Logan Mowry in second, and current Nordic Ski Club of Fairbanks FXC skier Ari Endestad in third. For the women, Kramer of FXC took the overall win in the final, followed by University of Alaska Anchorage (UAA) skier Hannah Rudd. Kramer’s FXC teammate Victoria Bassette was third to give Fairbanks skiers five out of six overall podium spots. The day began with good news: the famed Birch Hill inversion (a meteorological phenomenon in which Birch Hill, elevation ca. 900 feet, is substantially warmer than low-lying parts of Fairbanks just a few miles away) was in full effect. The racers came, the temperature didn’t drop too much, and at 11 a.m. sprint qualifying began, on a 1.6 km course for U16+ racers and a 1.2 km course for U14 racers. After 51 women had made their way through the Kikkan Randall-approved Birch Hill sprint course, UAF skier Kati Roivas of Finland had set the day’s fastest time, 4:39.54, with Kramer second. (Roivas did not race in the heats.) There was a gap of over a minute to 30th, where Hannah Cryder qualified after a brutal 5:43.19 of L4 effort. For a sprint qualifier. As discussed, it was cold and slow. In the men’s field, 2018 Olympian Logan Hanneman paced the field of 68 U16+ racers with a 3:49.11. Karl Danielson was second, over 11 seconds back. 48.97 seconds back of Hanneman, Bradley Walters rounded out the top 30 with a 4:38.08. Hanneman’s time was over twice as slow as the best qualifying time for the previous Besh Cup sprint, 1:44.47, held on an easier, shorter, and faster course two weeks earlier. On the shorter 1.2 km course covered by U14 racers, Sammy Legate posted her second dominant qualifying performance in as many weekends, clocking a 3:52.70 to claim the fastest U14 girls time by nearly 14 seconds. Legate’s time would have placed her eighth among U14 boys, where Murphy Kimball set the fastest qualifying mark of 3:33.51. In the heats, Hanneman took the win on roughly the same course on which he captured his first ever national title, the skate sprint championship at 2017 Spring Series. No times were available for the heats or final, and this reporter was only on site for Sunday’s races and so does not have first-person observations of Saturday’s finishes. But Hanneman won, with Mowry and Endestad second and third. Karl Danielson, Kai Meyers, and Samuel Delamere took places fourth through sixth in the men’s final. The top Senior skiers were Hanneman and Mowry, then Brandon Herhusky in eighth overall (second in the B-Final). Top U20 skiers were places three through five in the A-Final: Endestad, Danielson, and Meyers. Top U18 skiers were Delamere, sixth in the A-Final, then Dale Baurick and George Cvancara, first and third in the B-Final. Two U16 skiers made it into the overall heats: Josh Baurick, who ended the day in 24th overall, and Aaron Maves (28th). The third U16 skier was Konrad Renner, who after missing out on overall qualifying won the U16 bracket “bonus final” to place 31st overall. For the women, Kramer led the way in an A-Final that featured two U16 and two U18 athletes alongside two Senior women. Kramer took the win, followed by UAA skier Hannah Rudd in second and U16 skier Victoria Bassette in third. Garviey Tobin (U18), UAF skier Sage Robine (Senior), and Meredith Schwartz (U16) also made the A-Final. Kramer and Tobin led the way for the U18 podium. They were followed by Annie Gonzales, who was second in the B-Final for eighth overall. 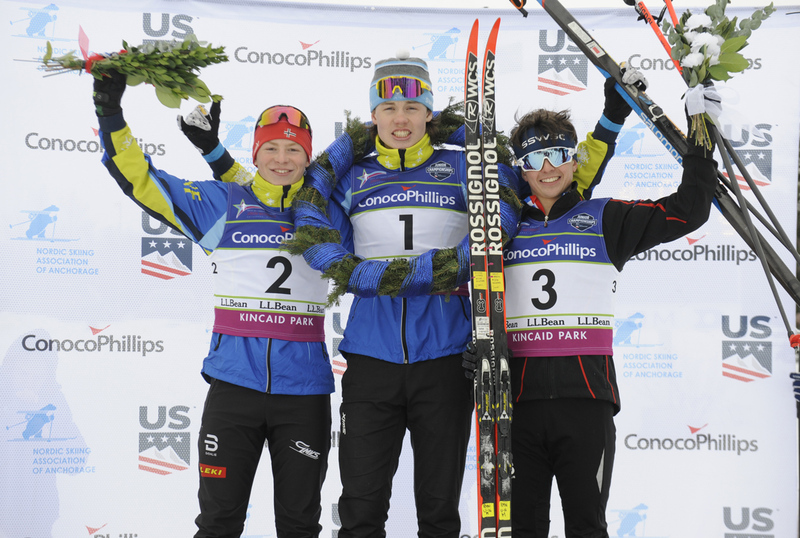 The U16 podium was Bassette, Schwartz, and Quincy Donley, who won the B-Final to claim eighth overall. The Senior women’s podium was Rudd and Robine from the A-Final, then Roivas, who did not contest the heats after posting the fastest time in qualifying. Sunday morning brought an unusual combination for much of the country: 4 above and snowing. For Fairbanks, though, this was hardly noteworthy. “I would say it’s nothing new,” said Roivas to FasterSkier when asked if she often experienced fresh snowfall at 4° F.
The snow may have been slow (narrator: it was), but Roivas was faster than anyone else on Sunday, opening up a lead in the U18+ 10-kilometer freestyle mass start by the end of the first gradual climb out of the stadium, and never looking back. She kept her lead through two laps of the 5 k course, covering two A Climbs and three B Climbs per lap to finish in 31:52.7, taking first in the field of 22 athletes by over a minute. 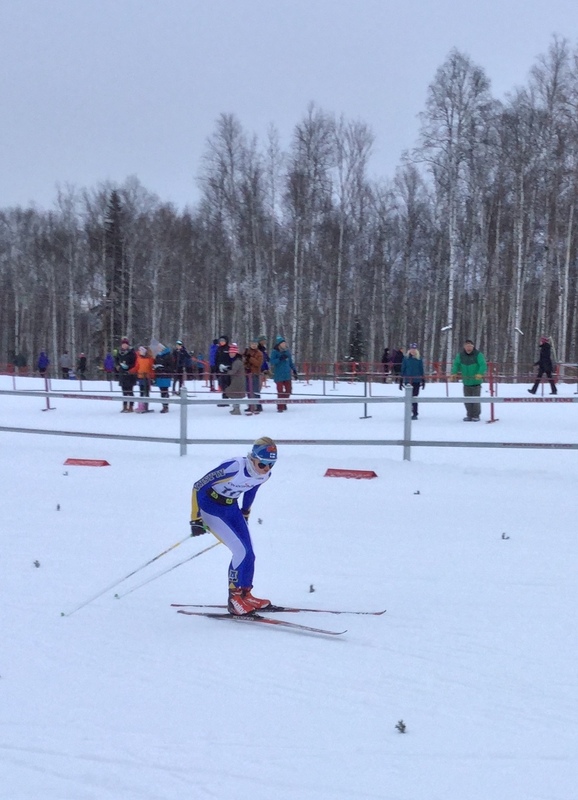 Roivas was staying in Fairbanks while most of the UAF men’s team, and roughly half the UAF women’s team, competed in RMISA races in New Mexico. LeClair similarly found the race “Tough,” she told FasterSkier soon after finishing 1:16.6 back of Roivas. LeClair noted that she had sat out Saturday’s sprints, to avoid worsening a cold by breathing in the frigid air. Behind Tobin in third overall, the rest of the U18 girls podium was Eski in fourth overall, then Annika Hanestad (sixth). The U20 women’s podium was LeClair (second overall), Emma Jerome (11th), and Ellie Mitchell (12th). 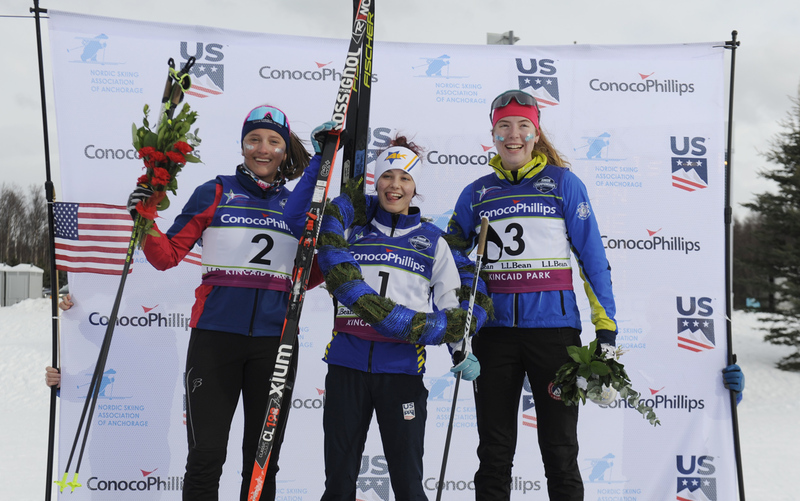 The Senior women’s podium was all collegiate skiers: UAF’s Roivas in first, Hannah Rudd of UAA (fifth overall) in second, and Sage Robine of UAF 15th overall) in third. The top Masters woman was M4 racer Alison Arians, in seventh overall. 25 U16 girls raced a 5 k mass start, over a single lap of the same 5 k course. The leaders featured several familiar podium finishers: Quincy Donley in first, Victoria Bassette (+22.4) in second, and Meredith Schwartz (+41.0) in third. 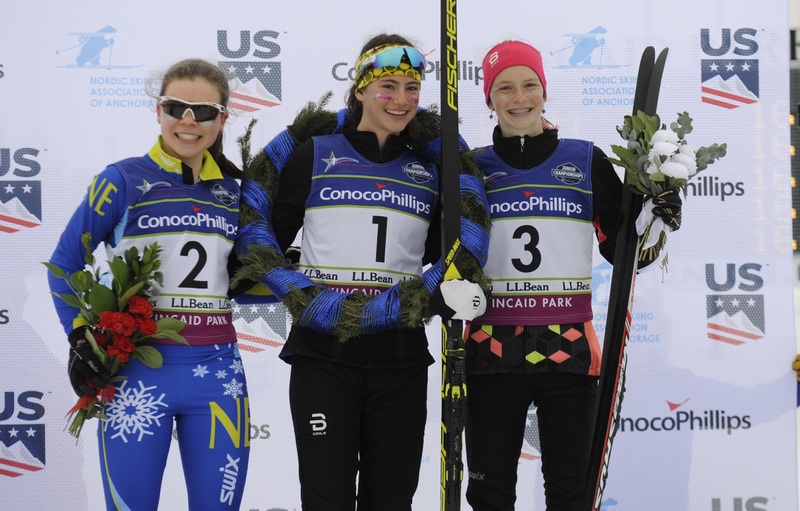 All three athletes recorded five U16 girls podium finishes in six Besh Cup races this season. And 13 U14 girls raced a 3 k mass start. Here Sammy Legate took her fourth victory and sixth podium of the season in 11:00.8, while Heidi Schumacher (+0.6) was narrowly behind in her fourth runner-up finish and sixth podium of the season. Zarah Laker-Morris (+23.4) was third. The U18 and up men’s race played out similarly to the women’s 10 k: Gus Schumacher notched a wire-to-wire victory while a fight for second played out behind him. Schumacher won the 10 k mass start, held on the same two-lap course as the women’s race, in 26:33.0. Mowry and Endestad reprised their podium finishes from Saturday, taking second (+1:25.5) and third (+1:31.0) once more. Schumacher’s last race was also a victory, if perhaps a higher-profile one: He anchored the U20 men’s world champion relay team at World Juniors in Lahti in late January, pulling away from Alexander Terentev up the final hill to secure an American victory over Russia by 3.8 seconds. Schumacher’s margin of victory, nearly 90 seconds, was somewhat greater this weekend in Fairbanks. Nonetheless, the U20 racer found what he was looking for in Besh Cup competition. 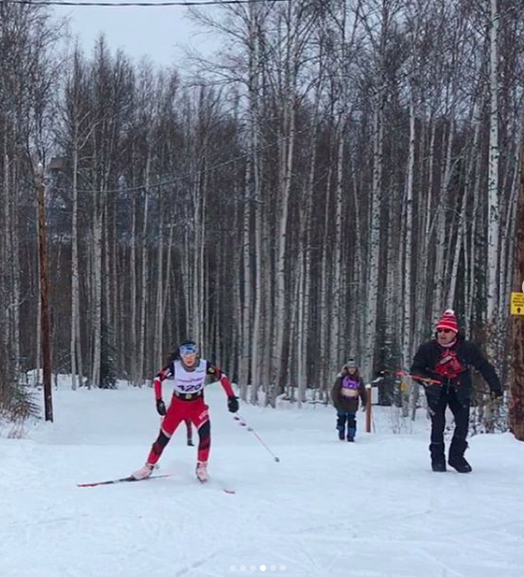 Schumacher is undefeated in Alaska races this season, with victories in three Besh Cup Races in Fairbanks and Palmer, two Alaska Nordic Cup races in Fairbanks, and the Race to the Outhouse #1 at Hatcher Pass. Kai Meyers, who was fourth overall, 15.9 seconds out of third, made up the rest of the U20 podium behind Schumacher and Endestad. Mowry (second overall) led the Senior men’s podium, followed by Julien Bordes (eighth) and Brandon Herhusky (16th). The top Master was Alaska Nordic Racing coach Cody Priest, who started in bib no. 36 in the seeded mass start but quickly moved up to finish seventh overall. A field of 21 U16 boys raced a single lap of the same 5 k course. Aaron Maves took the victory here in 14:43.6, giving him a tidy six podiums in six Besh Cup races this season. He was followed by Josh Baurick (+8.6, four U16 podiums this season) in second and Eli Merrill (+21.8, two U16 podiums this season) in third. Finally, U14 boys raced a 3 k mass start. Skyler Amy was one of two boys to break 10 minutes on the hilly course, finishing in 9:54.5. Elias Engman, in 9:59.3 (+4.8), was the other. Murphy Kimball (+10.6) was third. Sunday’s race marked the end of a successful, if logistically trying, Besh Cup qualification series. Cross Country Alaska organizers normally meet three times per winter to coordinate the three race weekends; this season’s races required eight meetings. 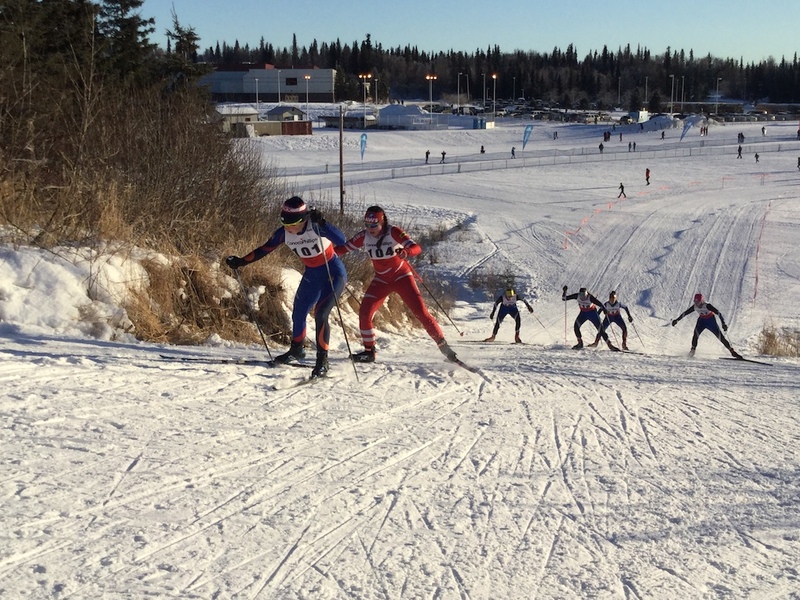 In the end, however, the Mat-Su Ski Club, Tsalteshi Trails Association, and Nordic Ski Club of Fairbanks provided six high-quality races, two sprints and four distance races, to Alaskan skiers. Two of them were FIS races. All of them were NRL (National Ranking List) races. None of them was easy. Additionally, Kendall Kramer, Jenna Difolco, Adrianna Proffitt, Molly Gellert, Helen Wilson, Maja Lapkass, and Anja Maijala, for U18/U20 girls, and Gus Schumacher, Luke Jager, Ti Donaldson, Zanden McMullen, JC Schoonmaker, Maxime Germain, Michael Earnhart, and Alexander Maurer, for U18/U20 boys, qualified on the basis of their performances outside of the Besh Cup series, and are also eligible to race for Team Alaska next month. Junior Nationals begin March 9 in Anchorage. The 2019/2020 Besh Cup series begins again in December, when skiers and their parents will once more make their way through the Girdwood Tesoro, the Turner’s Corner ice cream stand, the oversize baggage claim area of the Fairbanks airport, and other athletic stations of the cross. SOLDOTNA, Alaska — The most famous names and lowest FIS points were gone from the results sheet for the season’s second Besh Cup weekend of Junior Nationals qualifying races, as Hailey Swirbul, Gus Schumacher, Luke Jager, Kendall Kramer, et al., were busy representing America while racing in Europe. 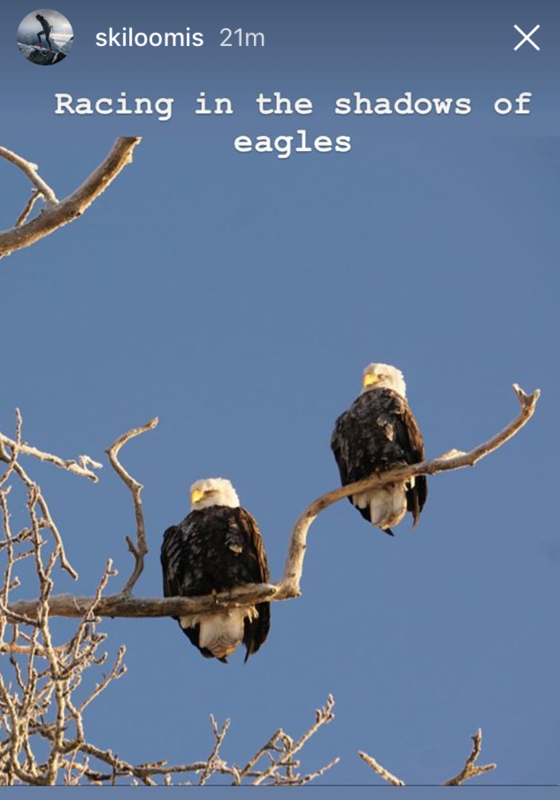 In their stead another representation of America, a dozen bald eagles, watched over Saturday’s freestyle sprints and Sunday’s distance classic races from their perch in the trees overlooking the stadium behind Skyview Middle School on the Kenai Peninsula. America’s top U23 and U20 skiers are presumably enjoying a healthy diet while in Lahti for World Juniors. The convocation of eagles, by contrast, owes its presence to the stadium’s proximity to the Central Peninsula Landfill just down the road. Saturday morning dawned clear and cold. It was FIS-legal, but only barely. Racers streamed into the middle school for bibs and bathrooms, then out onto the course well in advance of the 9:45 a.m. sunrise. If you have a stereotypical but justified image of coaches testing wax by headlamp in the pre-dawn cold, this morning delivered. A field of U16+ men had bibs no. 1–88 and the morning’s first qualifying starts. A short-notice 10-minute hold ensued before bib no. 1 made it on course, as timing equipment malfunctioned in the cold. Racers began at around 10:10 a.m. Within minutes, however (approximately after bib no. 15 had started and while bib no. 16 was standing in line about to go out), another hold was imposed for additional timing troubleshooting, while racers already in the start line shivered in their Soldotna High blankets provided by race organizers, and racers not already in the start line shivered in their warmups. Qualifying eventually resumed, at 15-second intervals, with a manual start protocol featuring an old-school, hand-on-the-shoulder, don’t-leave-until-I-say-go approach. The sprint course was short and sweet, which also meant that it was a brutal hammerfest: A few hundred meters flat out of the start, up a hill, down a hill, another hundred meters flat around a sweeping lefthand turn, then up and down another hill to the finish, potentially with enough speed to freeskate to the line. After roughly 88 U16+ men had put their best V2 and jumpskate to the test, it was Patrick Marbacher who posted the day’s best qualifying time of 1:44.47. There was a gap of precisely 13 seconds to 30th place, where Jordan Laker-Morris clocked a 1:57.47 to take the last qualifying spot. The men were followed by the U16 and up women. 67 athletes later, Victoria Bassette had notched the fastest qualifying time of 2:05.15. The women’s field was not quite as tight as the men’s; there was a gap of 20.21 seconds between her and 30th-place qualifier Zoe Chang (2:25.36). There were few surprises en route to the finals, which were held around 2 p.m. in mercifully warmer temperatures as the sun shone on the entirety of the spectator-friendly course. The men’s final featured Marbacher (bib no. 1 for fastest qualifying time), Julien Bordes (bib no. 2), Miles Dennis (bib no. 3), Karl Danielson (bib no. 4), Eli Hermanson (bib no. 6), and Ari Endestad (bib no. 8). In the end, the biggest surprise may have been the relative ease with which Endestad skied away from the field, benefitting from some unfortunate positioning behind him to open up a gap going up the second hill. He pressed hard over the top and kept his lead to the finish seconds later, slowing up slightly to look around and celebrate before crossing the line with his first-ever Besh Cup victory. Endestad explained that his finish-line celebration had been spontaneous, not planned. 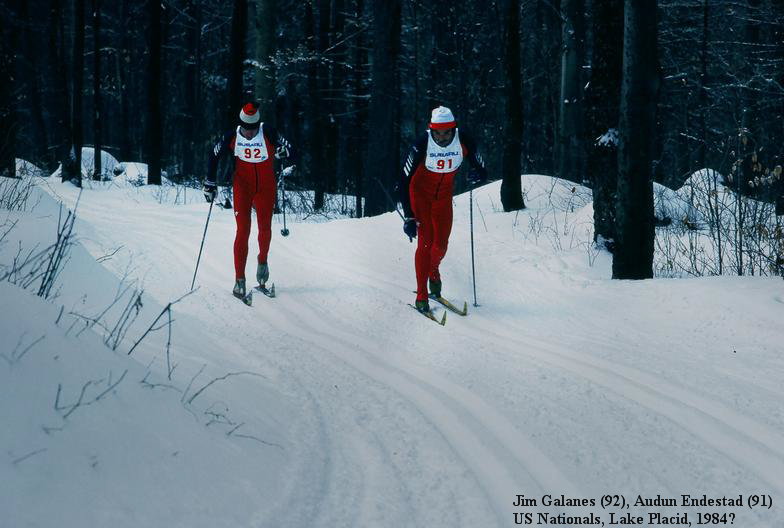 Jim Galanes (l) and Audun Endestad racing in Lake Placid in the 1980s. Courtesy photo. Ari Endestad’s last name may be familiar to longtime fans of the sport: His father, Audun, placed 18th in the 50 k at the 1984 Winter Olympics in Sarajevo and won thirteen national titles, reaching the U.S. nationals podium in 1993, days before his fortieth birthday. On the continuum from Marv Marinovich to laidback sports dad, Ari reports, his father is decidedly the latter. Behind Endestad in second, Bordes explained the slowdown that left him unable to contest the finishing sprint. The women’s final, held moments later, featured one of the closest finishes of the day. Marion Woods moved up from second midway through the final to come into the lead by the top of the last uphill. She kept that position as she led the first four racers to the line, staying low and employing a powerful free skate all the way to the finish to come in less than a ski length ahead of Alaska Winter Stars teammate Quincy Donley. Victoria Bassette was roughly half a ski length behind Donley for third, with Annie Gonzales about a ski length behind her in fourth. Garviey Tobin and Annika Hanestad crossed the finish line in fifth and sixth a few seconds later. The women’s final was similarly top-heavy, with five of the day’s six fastest qualifiers represented. The only absence was the day’s second-fastest qualifier, Aubrey LeClair, who placed fourth in her semifinal to miss out on the A-Final, then took the B-Final with relative ease. The women’s winner, Woods, is a 2017 graduate of the University of Vermont, where she raced on the ski team. 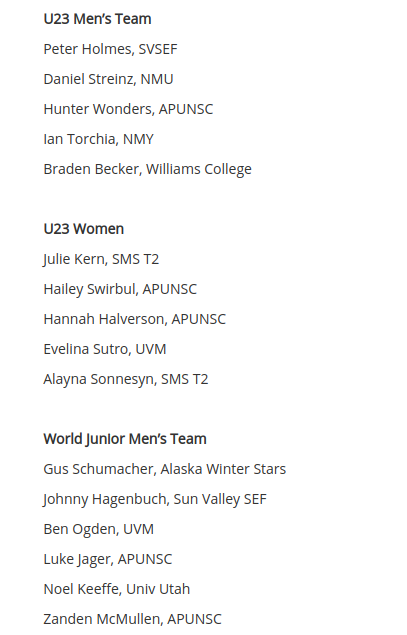 Along with Gus Schumacher, she makes up the entirety of what Schumacher recently termed the Alaska Winter Stars Elite Team, as two of the only post-high school skiers in the program. “I hope I’m doing Gus proud out here, holding it down in Alaska,” Woods said, speaking with FasterSkier on Saturday afternoon, roughly 12 hours before Schumacher placed 16th in the classic sprint at World Juniors. The Winter Stars Elite Team had a strong weekend. Woods, 23, is currently in her tenth year of racing Besh Cups, and this weekend marked at least her fourth time racing on the Tsalteshi trails at Skyview Middle School. She brought that experience to bear when asked about her approach to the sprint course. Donley has higher hopes for this year’s JNs, to be held on her home course at Kincaid Park in Anchorage. “My goal is to make it to Junior Nationals, and hopefully get a podium there,” she told FasterSkier at the finish. Donley said that she had “an interesting start” in the final, but “was able to make it up a little bit, and then skate my way to the finish” to take second overall. As the Anchorage Daily News headlined its coverage of the weekend, “Marion Woods sweeps Besh Cup races on Tsalteshi Trails, but young skiers shine too.” Indeed, Donley said that she wasn’t even the youngest skier in the final, pointing instead to Victoria Bassette of Fairbanks. “It’s definitely an indication of greatness to come,” Donley said, only sort of tongue-in-cheek, when asked what her and Bassette’s presence in the final meant for the next couple years of Alaskan junior girls skiing. “There’s lots of up-and-coming fast skiers that I’ve noticed. And I used to be one of the youngest skiers, on the younger end, but now I’m seeing a lot of girls who are even younger than I am, and they’re super fast, which is awesome. It’s great to have some competition. Woods topped the overall podium on Saturday, but also the Senior podium, as the only Senior or Master woman in the field. The U20 women’s podium was Aubrey LeClair (7th overall), Ellie Mitchell (10th), and Emma Jerome (17th). The U18 girls podium was spots fourth through sixth in the A-Final: APU teammates Gonzales, Tobin, and Hanestad. The top three U16 skiers were Donley and Bassette, second and third in the A-Final, and then Meredith Schwartz, third in the B-Final for ninth overall on the day. The men’s field saw less of a youth movement, as only two U16 boys cracked the top 30 to qualify for the main heats. (Separate semifinal and finals races were held for the 12 fastest U16 boys outside the top 30.) Making the top 30 were Kai Caldwell, 25th overall, and Aaron Maves, 27th overall. Konrad Renner, winner of the U16 A-Final for 31st overall on the day, rounded out the U16 boys podium. The U20 men podium was all drawn from the A-Final: Endestad (1st overall), Marbacher (3rd), and Dennis (5th). The U18 boys podium was Hermanson (4th overall), Samuel Delamere (8th), and Everett Cason (12th). Of the five Senior men in the field, two of them made the heats. One of them, Bordes, reached the A-Final, where he finished second overall. The other was former Nordic Combined World Cup skier Adam Loomis, who now coaches jumping in Anchorage after retiring from NoCo. Racing in his first-ever sprint, Loomis qualified in 23rd, then finished fourth in his quarterfinal en route to 18th overall. Matthew Muffoletto (45th) rounded out the Senior men’s podium. Finally, in the U14 boys bracket, Skyler Amy, Paul Hlasny, and Murphy Kimball led the way. The next morning was even colder. When Kyle Foster led a field of four U10 boys out of the stadium in the day’s first race at 11:02:30 a.m., temperatures were probably not yet FIS-legal (the cutoff for which is -4 F). But these were not FIS races, and it really did feel warmer in the sun, and the day went off as planned. All distance races were run as interval starts, making for three interval-start distance races out of the first four Besh Cups following December’s shift to Government Peak Recreation Area, which features wide competition trails but a narrow stadium. A combined field of 78 women racers, age U14 and up, did one lap of a 5 k course. The 5 k course began with a sharp climb out of the stadium, then covered primarily doublepole-able, undulating terrain for another 2-3 kilometers before ascending a series of steep hills. A long, gradual uphill marked some of the final few hundred meters before dropping down to the finish, and a last chance to engage in a prolonged doublepole on tired muscles in front of all your coaches. As on Saturday, there was one Senior woman in the field: Marion Woods. And as on Saturday, Woods set the pace, taking the win in 14:34.70. Second overall was Aubrey LeClair, 10.96 seconds back. Third overall was Annika Hanestad (+16.96). The Senior women podium was, as noted, Woods, and that’s it. 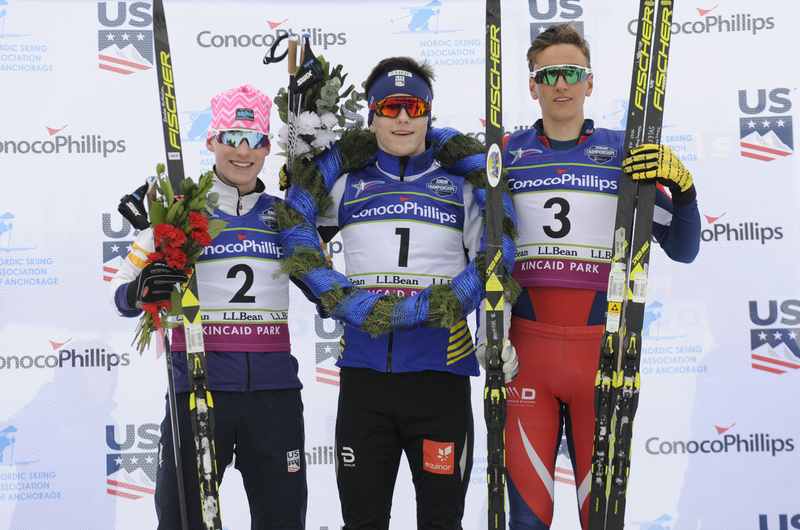 The U20 podium was precisely the same as in Saturday’s sprint: LeClair (2nd overall), Mitchell (12th), and Jerome (15th). The U18 podium also saw the same three athletes as on Saturday but this time in a different order: Hanestad (3rd), Tobin (4th), and Gonzales (7th). For the U16 girls, similarly, Donley (5th), Bassette (6th), and Schwartz (9th) showed their range, finishing in precisely the same order as in the sprint. There was one new name for the U14 girls podium: Schumacher (32nd overall) was first and Legate (36th) was second, but Piper Sears (48th) moved up to third in Sunday’s race. A field of 49 U14 and U16 boys raced the same 5 k course as the girls, with U16 boys taking the top 17 spots. First overall here was Josh Baurick, who finished in 13:29.08 on the firm and fast course. He was followed by Aaron Maves (+10.93) and Porter Blei (+18.53). 18th overall, and first among U14 boys, was Murphy Kimball. He was followed by Skyler Amy in 19th overall. Third place for U14 boys went to Aven Elsberg, who was 25th overall. Finally, 55 men and boys, aged U18 and up, raced a 10 k classic interval start. It was a single-lap 10-kilometer course, a rarity in this day and age. The course had two sharp climbs within the first kilometer, but was otherwise doublepole-heavy, undulating terrain through approximately the 5 k or 6 k mark. The hills that followed were not objectively all that demanding, but the transition from 15 minutes of mostly doublepole to steep striding can be an awkward one; many racers with low start numbers were walking up the final uphills. Eli Hermanson presumably did scant walking in taking the overall win, covering 10 k in 27:33.31. He was followed by Alexander Maurer (+9.91) in second, just 0.21 seconds ahead of Karl Danielson (+10.12) in third. After the race, Hermanson told local paper the Peninsula Clarion that he had been off his skis for a month following a late-November fall in icy conditions, and was pleased to be starting to return to form after a subpar performance at U.S. nationals earlier this month. The U18 podium was Hermanson, Maurer, and Joel Power, who was fourth overall, 6.32 seconds off the overall podium. 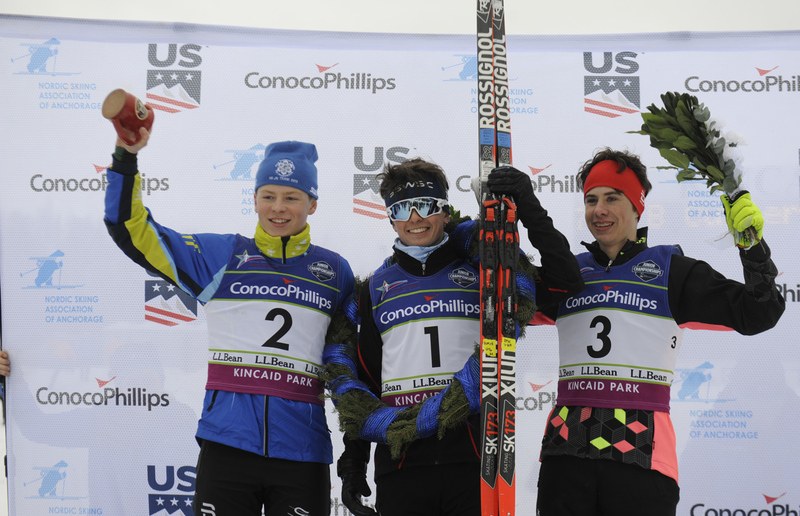 The top three U20 skiers were Danielson, then Saturday’s winner, Endestad (5th overall), and Kai Meyers (9th overall). There were only four Senior men in the field, led by Bordes in 7th overall, followed by Loomis (29th overall) and Muffoletto (44th). As the final racers crossed the finish line, volunteers began taking down the course, and coaches began packing up waxing equipment. A field of racers that predominantly hailed from out of town began the trek back to the Anchorage area (3 hours driving), Fairbanks (9 hours driving, or two flights), or Juneau (flights; you cannot drive to Alaska’s capital city). “Was there a ski race or something?” said the barista at Java Junction Too, the first coffee shack encountered by an Anchorage-bound racer heading east on the Sterling Highway away from the race venue. There had been, a reporter informed her. The final weekend of Besh Cup racing will be held in Fairbanks on February 2-3. The members of Team Alaska will be announced on February 3 after Besh Cup #6. Junior Nationals are in Anchorage from March 9-17. Perfect Scores! 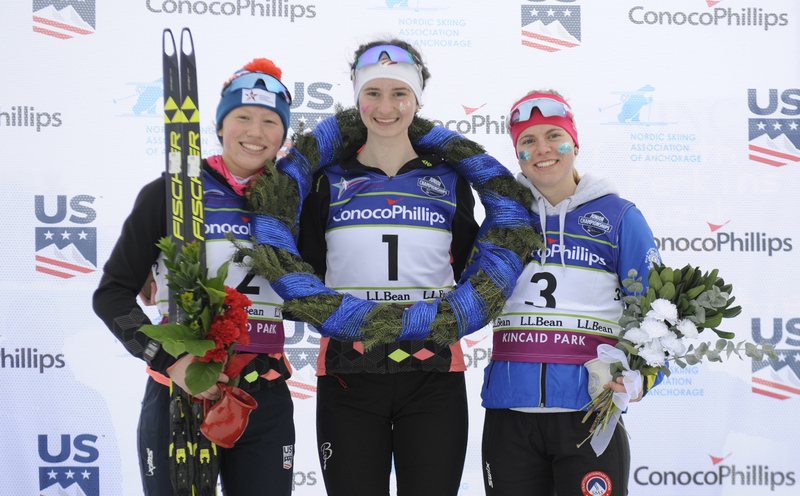 Both Gus Schumacher, Alaska Winter Stars and Kendall Kramer, Fairbanks XC swept the junior races to claim the top spot for the 2019 World Junior Championship Team, in Lahti, Finland. The fourth and final day of 2018 U.S. Ski & Snowboard XC Junior National Championships took place on Saturday with the 3.3-kilometer classic relays at Soldier Hollow in Midway, Utah. In the closest race of the day, Pacific Northwest reigned in the U16 women’s relay, with Isabel Max, Fiona Max and Annie McColgan (all of the Mt. Bachelor Sports Education Foundation) winning by 3.1 seconds in 38:23.2. Isabel tagged her sister in third, then Fiona raced up to first, which McColgan held to the finish, just ahead of Alaska’s Kendall Kramer in second. Kramer teamed up with Quincy Donley and Ivy Eski for second place (+3.1), while Rocky Mountain placed third (+6.9) with Katy Jane Hardenbergh, Haley Brewster and Tai-lee Smith. Will Koch won every race of the week, anchoring the New England U16 men’s team to the victory in 33:18.8. Koch had been tagged in first by teammate Aidan Burt, after Finn Sweet skied them into third by the first exchange. Intermountain (Aidan Rasmussen, Elijah Weenig and Kai Mittelsteadt) placed second (+29.4) while Pacific Northwest (Travis Grialou, Ian Delong and Walker Hall) claimed third (+32.7). Pacific Northwest also scored a victory in the U18 women’s relay with Ella-Sophie Kuzyk, Gretta Scholz and Novie McCabe (all of the Methow Valley Ski Education Foundation) in 36:46.4. For McCabe, it was her third-straight win of the week, and she anchored the team to first after being tagged in second. New England finished 44.9 seconds later for second place with Charlotte Ogden, Sophia Laukli and Mae Chalmers. Alaska rounded out the podium in third (+1:31.1) with Heidi Booher, Aubrey Leclair and Molly Gellert. For his second win of the week (and fourth top-two finish), Ben Ogden anchored his New England team (with James Kitch and Gregory Burt) to first in 24:41.1, while Rocky Mountain (Collin Wilson, Cameron Wolfe and Garrett Butts) finished 25.8 seconds later for second place. Rocky Mountain was first after the first two legs with Wilson and Wolfe. New England had two teams on the podium with Joshua Valentine, Isaac Freitas-Eagan and Conor Munns combining for third place (+44.9). U18 skier Callie Young anchored New England’s U20 women’s team to the win in 36:23.8, teaming up with Phoebe Sweet (also a U18) and Rena Schwartz (U20). Sweet had put them in eighth at the first exchange, and Schwartz raced the fastest second leg to bring the team to fourth. Young then clocked the third-fastest last leg to take the win. Rocky Mountain finished 13.9 seconds back in second place, with U18 skiers Chelsea Moore and Gracelynn Shanley and U20 athlete Marit May. Shanley had skied them from fifth to second on the second leg, before May finished second behind Young. Intermountain’s Sofia Shomento, Ariana Woods and Annika Landis took the third step on the podium in third (+17.1). Hunter Wonders scored his third win of the week with Team Alaska in the men’s U20 relay, winning by 14.8 seconds in 21:54.7 minutes with Dawson Knopp and Canyon Tobin. All three are Alaska Pacific University teammates. Knopp started the team off, tagging them in second at the first exchange, and Tobin raced up to first, a position Wonders held to the finish. New England placed second in that race with Adam Witkowski (a U18 skier), John Henry Paluszek and Adam Glueck. Rocky Mountain reached the podium in third (+22.8) with Noel Keeffe, Wyatt Gebhardt and Nolan Herzog. Will Koch of the Stratton Mountain School (SMS) continued his undefeated streak as he won his third-straight race at 2018 Junior Nationals. He dominated the U16 men’s 5 k mass start with a 39.9-second win in 17:16.3. Cooper Lennox of Mora High School raced to second place and Logan Moore of the Durango Nordic Ski Club reached the podium in third (+51.2). After placing second in Tuesday’s 5 k classic, Kendall Kramer of Fairbanks NSCF-FXC moved up to the top step of the podium with a win in the 5 k freestyle mass start in 20:15.7. Vail Ski Club teammates Emma Reeder and Haley Brewster followed in second (+15.7) and third (+27.4), respectively. Anja Maijala, an University Alaska Fairbanks freshman representing the Midwest division, raced to the win in 30:09.8, while Annika Landis of Middlebury College and the Intermountain division followed 8.5 seconds later in second place. Erin Moening of Northern Michigan University/Midwest was next across the line in third (+27.8). Freestyle sprint champion Novie McCabe of the Methow Valley Ski Education Foundation picked up her second-straight win, this time in the freestyle distance race, finishing first in 33:37.6. She broke away to win by more than a minute, while Luci Anderson of Loppet Nordic Racing followed in second (+1:17.5), and Mara McCollor of Wayazata Nordic placed third (+2:07.9). Gus Schumacher of Alaska Winter Stars raced to a 5.2-second victory over Ben Ogden (SMS), finishing in 21:32.2. Johnny Hagenbuch of the Sun Valley Ski Education Foundation (SVSEF) placed third (+13.3). Hunter Wonders tallied his second win of the week by 6.1 seconds over his Alaska Pacific University (APU) teammate Canyon Tobin, finishing first in 33:30.6. Xavier Mansfield of Northern Michigan University and the Midwest division took third (+8.4), just three seconds ahead of Patrick Acton of Michigan Tech/Midwest in fourth while Wyatt Gebhardt of the Steamboat Springs Winters Sports Club was another 0.9 seconds back in fifth. The 2018 U.S. Ski & Snowboard XC Junior National Championships opened on Tuesday at Soldier Hollow in Midway, Utah, with 5- and 10-kilometer classic individual starts. Racing continued on Wednesday with freestyle sprints. Below is a recap of the first two days of racing at SoHo. 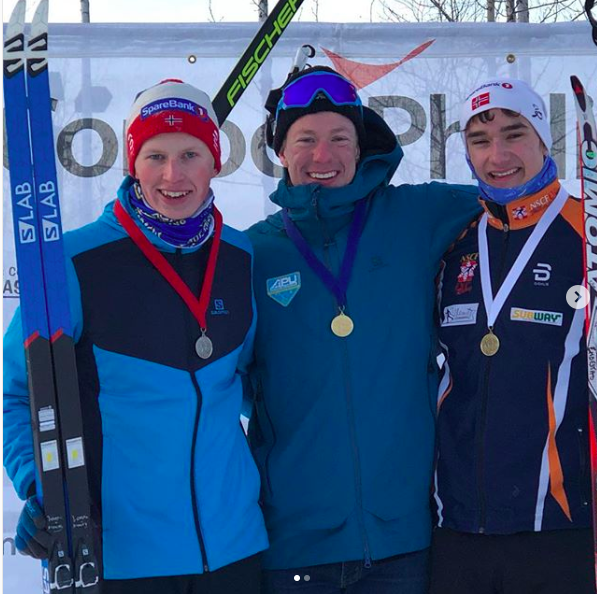 Nineteen-year-old Hunter Wonders of Alaska Pacific University (APU) posted a 12-second win in 23:35.3 minutes, while the Steamboat Springs Winter Sports Club (SSWSC) had two athletes on the podium with Noel Keeffe in second and Wyatt Gebhardt in third (+40.0). Ben Ogden, 17, of the Stratton Mountain School (APU) won by 14.4 seconds with a time of 23:01.5. Gus Schumacher of Alaska Winter Stars (AWS) finished second and his Alaska division teammate Luke Jager (APU) placed third (+52.2). Will Koch (SMS) took the win in 13:26.1, 15 seconds faster than fellow Vermonter Finn Sweet of the Craftsbury Nordic Ski Club. Wiley Corra of the Durango Nordic Ski Club reached the podium in third (+25.5). Annika Landis, a 19-year-old Middlebury College skier representing the Intermountain division, finished in 15:49.7 for the 5 k victory. Jordi Floyd (SSWSC) placed second (+21.2) and Rena Schwartz of the Green Mountain Valley School finished third (+35.7). Steamboat skier Waverly Gebhardt, 16, posted a 2.3-second win over Novie McCabe of the Methow Valley Nordic Ski Education Foundation with a winning time of 15:10.5. Molly Gellert (AWS) was just another 0.3 seconds back in third (+2.6). Sydney Palmer-Leger of the Sun Valley Ski Educational Foundation (SVSEF) won the women’s 14-15 category with a time of 15:21.2. Kendall Kramer of Fairbanks NSCF-FXC placed second (+25.8) and Libby Tuttle (Loppet Nordic Racing) joined them on the podium in third (+32.1). An extensive collection of photos from U23 and Junior World Championships at Soldier Hollow in Midway, Utah, is now posted on FlyingPointRoad.com. Here is a direct link to the gallery. Relive all the action in 30 seconds or less from the last two days of racing at 2017 Junior/U23 World Championships at Soldier Hollow in Midway, Utah. Here we have the 15/30-kilometer U23 skiathlons and junior relays, filmed and edited by Kirk Nichols of The Utah Nordic Alliance (TUNA). Kirk Nichols of The Utah Nordic Alliance put together the following 30-second highlight videos from Friday’s 10/20 k skiathlons at 2017 Nordic Junior World Championships at Soldier Hollow in Midway, Utah, including American Katharine Ogden’s race for third place in the women’s 10 k skiathlon. The following videos include highlights from Thursday’s 10- and 15-kilometer freestyle individual starts, the first distance race of U23 World Championships at Soldier Hollow in Midway, Utah. Filmed and edited by Kirk Nichols of The Utah Nordic Alliance (TUNA). 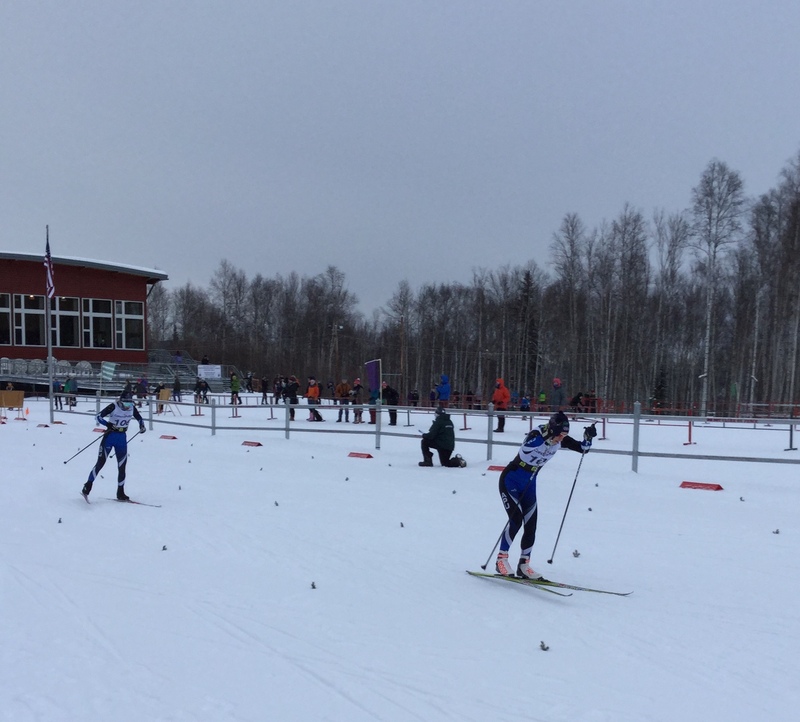 Three racers were double winners on the weekend, while a field of slightly more than 200 skiers enjoyed ideal conditions for two days of racing as the Besh Cup moved to the Tsalteshi Trails in Soldotna, Alaska, last weekend. 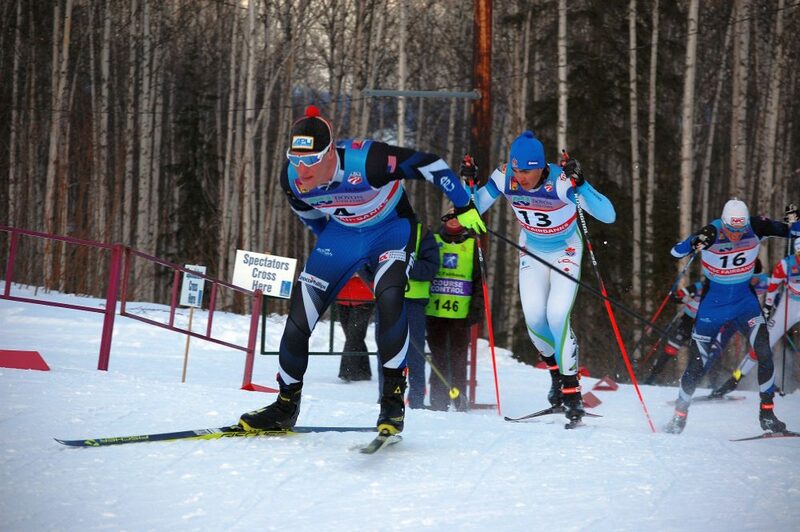 Qualifying races began in Anchorage in December with a classic sprint and a freestyle mass start. This weekend saw a skate sprint and classic interval start races. Conditions were unremarkable for Alaska in mid-winter: Race-time temps in the teens, light snow and sunshine. Many teams’ race wax choice for Sunday was straight Extra Blue. Easy. But the weather was also remarkable for how much worse it could have been. That weekend it snowed 32 inches in 24 hours in Moose Pass, roughly sixty miles east of the venue. 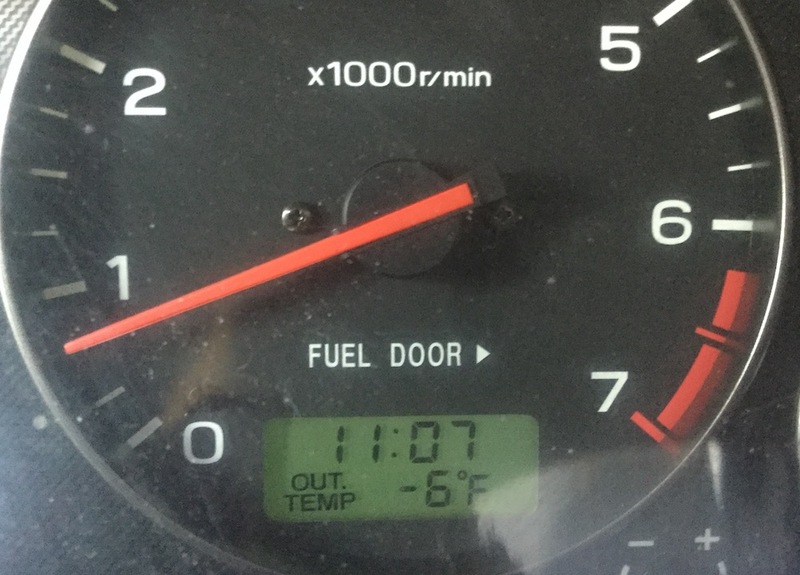 Just two days earlier, it had been –25° F in Soldotna on Thursday (and –27° F on Wednesday). Virtually the entire field presumably came in relatively fresh, following the mid-week cold snap that had sent temperatures to 20 below in Anchorage and 50 below in Fairbanks, and sent many athletes temporarily inside in both places. Racing at 12° above never felt so warm. On Saturday, the U14 girls raced a 1.1-kilometer freestyle sprint. Quincy Donley took her first victory on the weekend, setting a qualifying time that also would have led the U14 boys over the same distance and winning the final as well. Behind her were Katey Houser and Aila Berrigan. The U16 girls raced a 1.2 k skate sprint. Kaya Ratzlaff was fastest in this division, followed by Annika Hanestad and Helen Wilson. For U18 girls (also 1.2 k, racing head to head against U16 and U20), Jenna Difolco took her first victory on the weekend, followed by Elizabeth Mans and Heidi Booher. The overall podium for U16+ was U18 racer Difolco in first, UAA skier Sadie Fox (U20) in second, and U18 Mans in third. In the U14 boys 1.1 k skate sprint, Aaron Maves and Rowan Morse reprised their sprint podium finishes from Besh Cup #1 in Anchorage. They were followed by Konrad Renner. The U16 boys 1.2 k sprint also saw two-thirds of a repeat podium: of George Cvancara, Eli Hermanson, and Max Beiergrohslein, Cvancara and Hermanson were second and third in last month’s classic sprint. For U18 boys, competing head-to-head in the same 1.2 k sprint, it was Josiah Alverts, Karl Danielson, and Sam York. And the U20 men, finally, were led by Tracen Knopp, Logan Mowry, and Alex Kilby. The overall podium was Knopp, Alverts, and Mowry. Sunday saw more of the same: Donley leading the girls and beating most of the boys as well. In the U14 girls 3-kilometer classic interval start, Donley won with a time that would have placed her third in the U14 boys race. By over a minute. Marit Flora was second and Houser was third. The U16 girls raced a 5 k classic interval start. Kendall Kramer was first, Ratzlaff was second, and Hanestad third. It was the second podium on the weekend for both Ratzlaff and Hanestad. For U18 girls (also 5 k classic), Difolco took her second victory on the weekend, and Booher her second podium. Emma Nelson was third. Although there were few U20 women in the field, the overall winner in the classic race was Fox (U20), with Kramer and Ratzlaff (both U16) following. In the U14 boys 3 k classic, Maves was the final double winner with his victory there. Morse was again second. Third was Carter Brubaker. The U16 boys raced a 5 k classic. First was Zanden McMullen, followed by sprint podium finishers Hermanson and Cvancara. The U18 boys and U20 men, plus a handful of senior and masters skiers, raced a 10 k classic interval start. 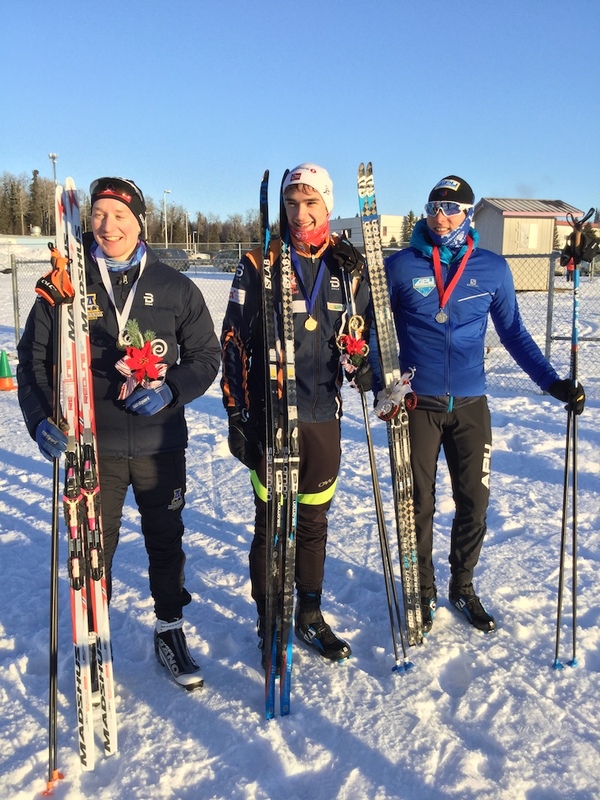 Top U18 skiers were Tristan Wiese, Andrew Hull, and Saturday’s sprint winner Alverts. Top U20 skiers, and top three overall for all skiers U18+, were Hunter Wonders, Mowry, and Hamish Wolfe. Wonders was tuning up for the Junior World Championships to be held at Soldier Hollow next week. 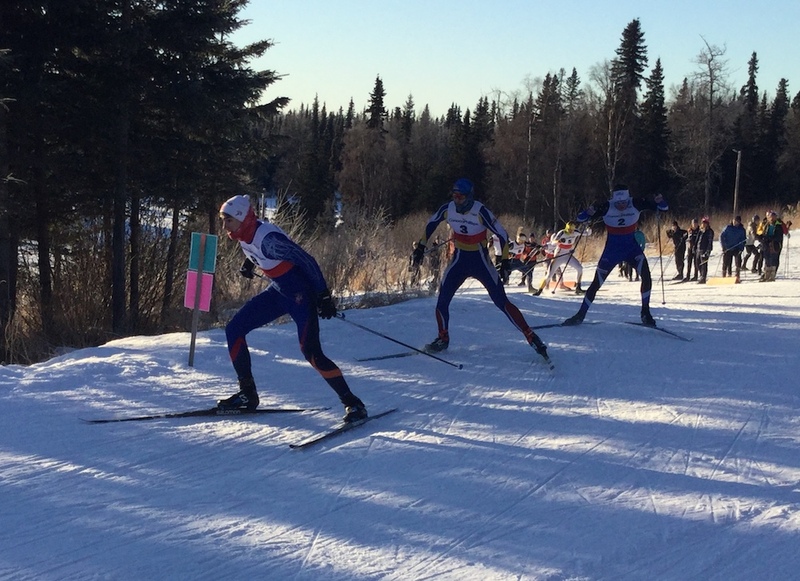 Racing continues at Birch Hill in Fairbanks the first weekend of February with skate interval start and classic mass start distance races. Alaska’s team for Junior Nationals will be named on the afternoon of February 5. FasterSkier is seeking regional contributors to write and submit race recaps from around the world. Please email info@fasterskier.com if interested. Special thanks to FlyingPointRoad for submitting the following photos. More photos can be found on Flyingpointroad.com. 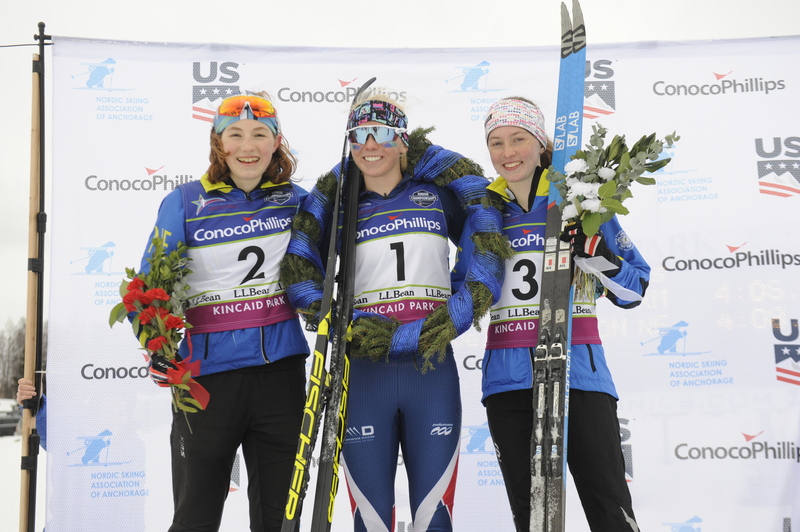 On Saturday, Hannah Miller of Bowdoin College won the A-final of the women’s 1.3 k sprint, with Taryn Hunt-Smith (Dartmouth Ski Team) placing second and Lucy Hochschartner (St. Lawrence University) taking third. Zoe Snow (Dartmouth), Alexandra Lawson of the Stratton Mountain School (SMS), and Hannah Cole (Williams Ski Team) also reached the A-final, finishing fourth, fifth and sixth, respectively. In the men’s 1.5 k freestyle sprint A-final, Fabian Stocek took the win ahead of his Dartmouth teammates Andrew Nadler and Koby Gordon, respectively. Three Williams skiers rounded out the final with Dylan Syben in fourth, Jack Schrupp fifth, and Hans Halvorsen sixth. In the U18/U20 women’s sprint, Callie Young (Craftsbury Nordic) won the A-final, ahead of Mae Chalmers (SMS) and Annika Martell (Colby College). James Kitch (Cambridge Sports Union) won the U18/U20 men’s A-final, with Russell O’Brien (Bowdoin) following in second and Nicholas Wilkerson (Frost Mountain Nordic) in third. Lillian Bates (Dublin XC) topped the U16 girls A-final, and Magdalena Lelito (Mansfield Nordic Club) took second and Ingrid Miller third. Joshua Valentine (Gunstock Nordic Association) won the U16 boy’s A-final, and Will Koch (SMS) placed second and Timothy Cobb (Mansfield Nordic) third. On Sunday, Laurel Fiddler of Bates College scored her first Eastern Cup win in the women’s 10 k classic mass start in 31:41.2. Snow notched second (+11.0), and Hunt-Smith tallied another podium in third (+19.0). Jørgen Grav (Ford Sayre) won the men’s 15 k classic mass start in 40:17.7, edging Eli Hoenig (Williams) by 2.9 seconds. Stocek placed third (+10.3) to end the weekend with back-to-back podiums. In the U16 girls 5 k classic mass start, Charlotte Ogden (SMS) captured the win in 15:51.9, ahead of Olivia Cuneo (Green Mountain Valley School) in second (+15.5) and Abigail Streinz (Outdoor Sports Institute) in third (+1:17.1). 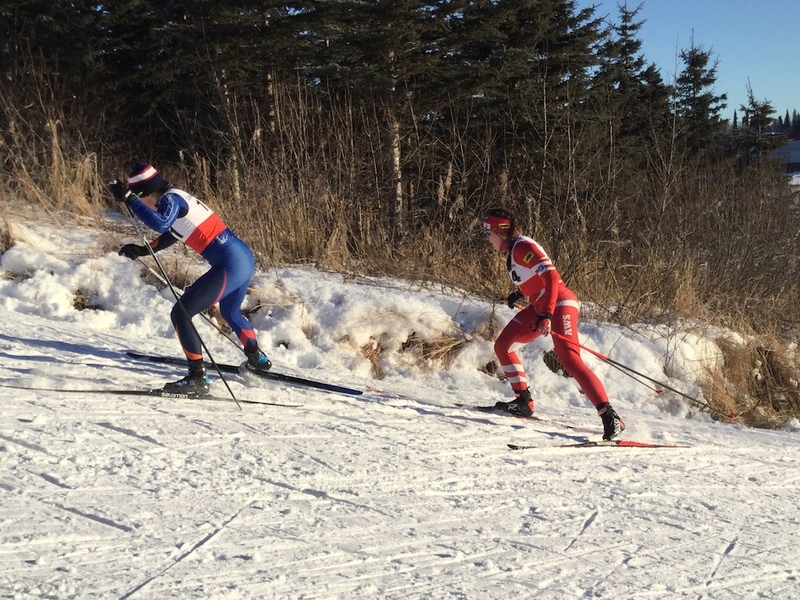 Valentine recorded another victory in the U16 boy’s 5 k classic mass start, and Koch repeated in second (+6.4) and Griffin Wright (Craftsbury Nordic) took third (+25.5). Along with its Junior and U23 World Championships teams, the U.S. 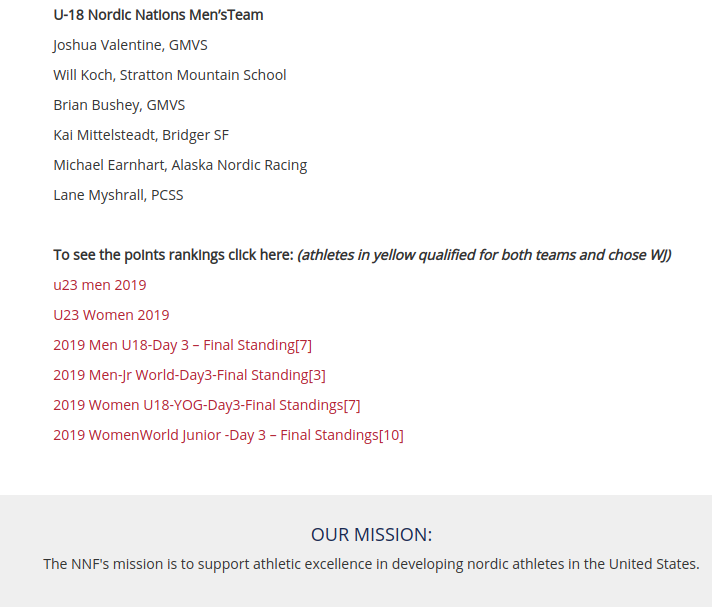 Ski & Snowboard Association (USSA) recently released its nominations for its U18 Nordic Nation’s Trip to Orkdal, Norway, for the Nordic Nations Junior Championships (officially, Nordisk Jr. Landskamp, which translates to Nordic Junior Superbowl) at the Knyken Skisenter. The trip spans from Jan. 22-Feb. 1. The U.S. trip will be led by Loppet Nordic Racing (LNR) coach Chris Harvey and include three days of races: a freestyle sprint on Jan. 27, 5/10 k classic on Jan. 28, and men’s and women’s relays on Jan. 29. Six men and six women were nominated. For the men’s team, two Alaska Pacific University (APU) skiers — Luke Jager and Canyon Tobin — were named, along with Ben Ogden of the Stratton Mountain School (SMS), Nolan Herzog (Ski Club Vail), Noel Keeffe (Steamboat Springs Winter Sports Club), and Gus Schumacher of Alaska Winter Stars (AWS). 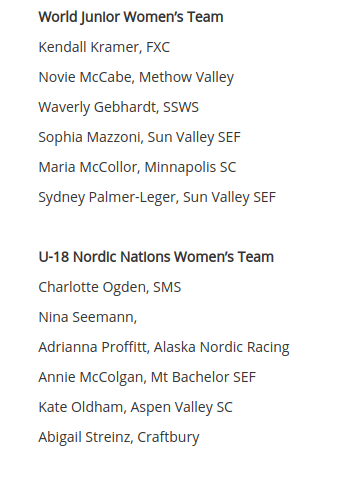 For the women, the list includes Ezra Smith (Summit Nordic Ski Club), Margaret Gellert (AWS), Anna Lehmann (SMS), Bridget Donovan (Ski Club Vail), Lucinda Anderson (LNR), and Sofia Shomento (Bridger Ski Foundation). Sydney Palmer-Leger (Park City Nordic Ski Team) qualified for the trip, but due to her age (14 years old) is not eligible to attend. Note: This recap has been corrected to reflect that Far West’s JC Schoonmaker was dubbed U16 men’s “King of the Hill” on Saturday, March 12. CABLE, Wis. (March 12, 2016) — The final competition of the 2016 USSA Junior National Championships concluded with a grueling Relay Hill Climb race up Mt. Telemark. 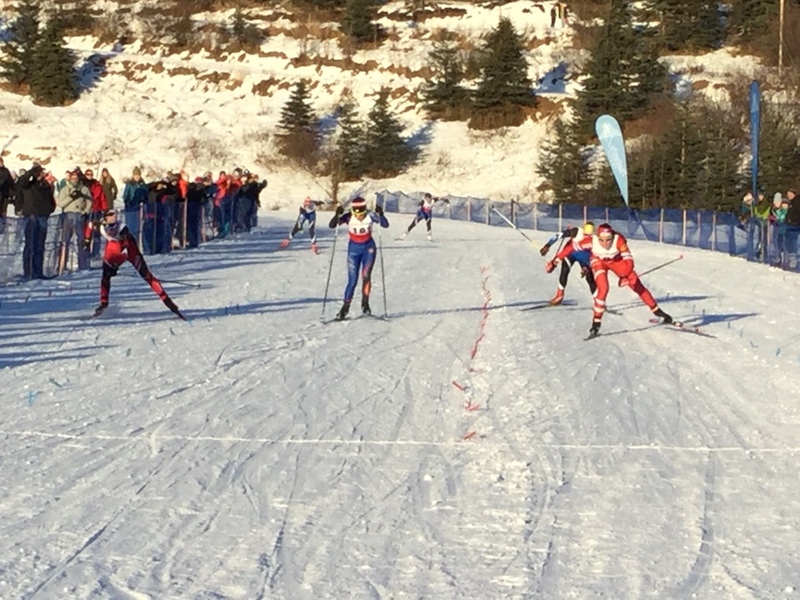 The pressure was high, as this race not only determined the Junior National Champion relay teams, but also the “king and queen of the hill” as well as the winner of the coveted Alaska Cup. New England claimed the Alaska Cup, which is the award for the team who wins the most points overall, throughout the four days of competition. In the U20 men’s hill climb, Max Donaldson, Travis Cooper and Luke Cvoncara representing team Alaska edged New England (Lewis Nottonson, Kamran Husaid and Land McKenny) for the Junior National Relay Hill Climb title by 1.7 seconds, followed by Midwest (Nick Gardner, Tamer Mische-Richter and Will Bodewes) who finished third. 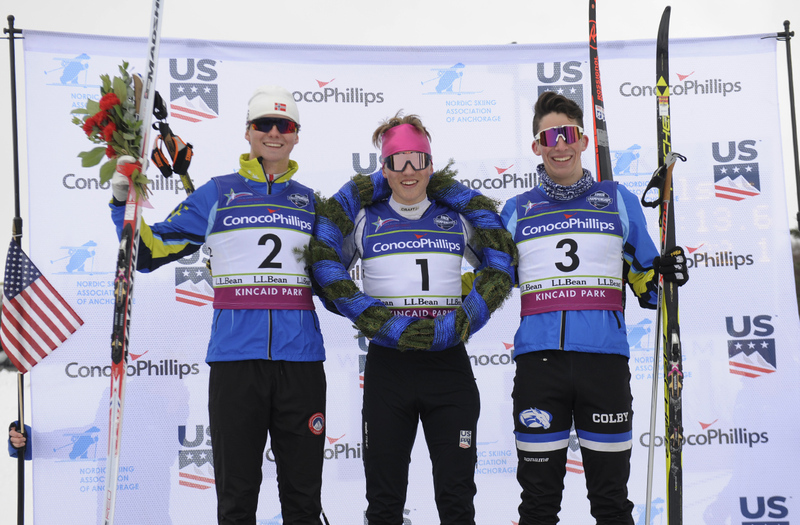 Team Alaska was led by Cooper, who had the fastest time, skiing the hill climb in just 5:40.8. Cooper also had the fastest time and was crowned “King of the Hill” for the U20 men. In the U20 women’s relay, the Midwest team (Margie Freed, Mikaela Keller-Miller and Caroline Brisbois), charged up the hill to claim a convincing first place finish as well as the Junior National Relay Hill Climb title. The team was led by Freed who skied the hill climb in 6:39.2, which was the fastest in the U20 female class and made her “Queen of the Hill”. The strong Midwest team finished 16.3 seconds ahead of teammates and the second Midwest team (Sarah Bezdicek, Abigail Drach and Mattie Watts), followed by New England (Lauren Jertberg, Kaelyn Woods and Katie Feldman) who finished third. Intermountain (Brooke Dunnagan, Anna Gibson and Sofia Shomento) claimed the U18 female Junior National Champion Relay Hill Climb title. The team was led by Dunnagan who skied the climb in a time of 6:52.5, which made her “Queen of the Hill for the U18 women. Intermountain dug deep to claim the victory 15.7 seconds ahead of New England (Leah Brams, Makenzie Rizo and Rena Schwartz) and Alaska (Anna Darnell, Magalen York and Jenna Difdeo), who finished third. In the U18 men’s relay, Alaska (Hunter Wonders, Canyon Tobin and Tracen Knopp) hammered their way up Mt. Telemark, to secure the Junior National Relay Hill Climb. 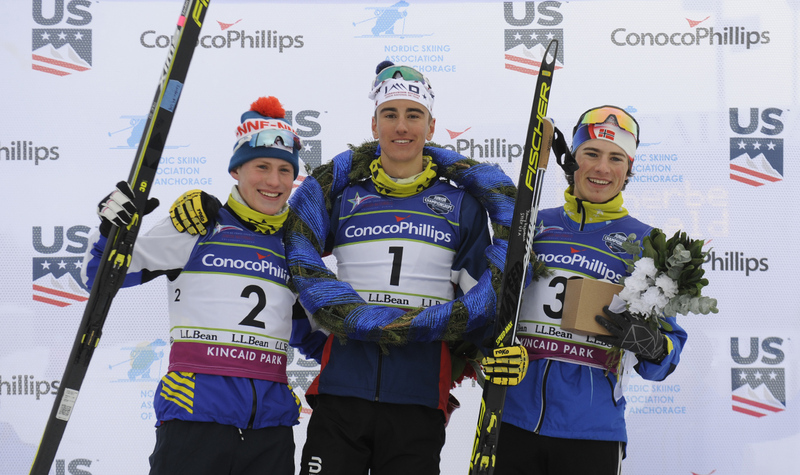 The team was led by Wonders, “King of the Hill,” who skied the fastest time for the U18 men in a time of 5:32.0. Wonders edged Mid-Atlantic skier Karl Schulz by 0.2 seconds who was the second-fastest hill climber of the day for U18s. Alaska skied to a first place finish just 11.1 seconds ahead of Mid-Atlantic team (Shulz, Bryce Harman and Henry McGrew), followed by New England (Daniel Steinz, Adam Glueck and Will Rhatiann), who finished third. Alaska (Luke Jager, Ti Donaldson and Gus Schumacher), battled to the top to claim the U16 men’s Junior National Relay Hill Climb title by 17.6 seconds over Far West (JC Schoonmaker, Hayden Halvorsen and Nate Cutler). Schoonmaker was fastest of the U16 man and dubbed “King of the Hill” with a time of 5:44.5. Rocky Mountain placed third, with Cameron Wolfe, Jimmy Colfer and Collin Wilson. In the U16 female relay, Midwest (Abigal Jarzin, Kelly Koch and Lucy Anderson) dominated the hill climb to claim the Junior National Relay Hill Climb title. 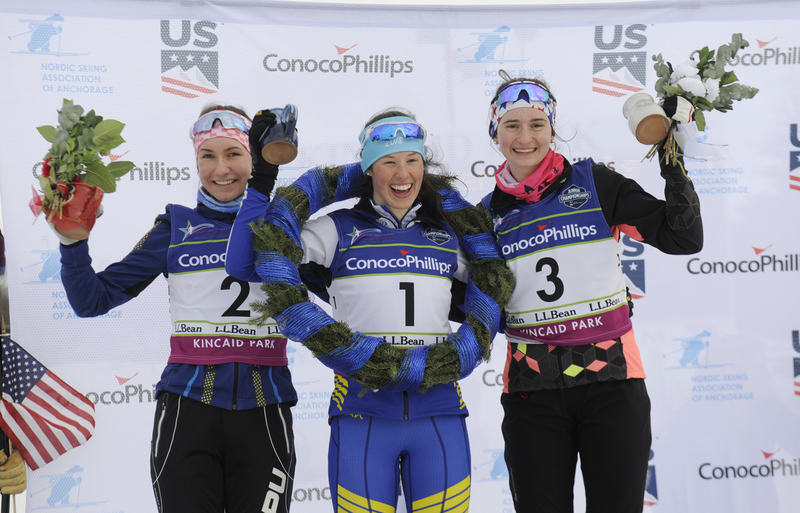 The team was led by Koch was crowned “Queen of the Hill” who skied the hill in a time of 6:49.7, which was also the fastest time for the U16 females overall. Midwest finished 19.2 seconds ahead of New England (Anna Lehmann, Callie Young and Laura Appleby), followed by New England (Phoebe Sweet, Charlotte Ogden and Mae Chalmers) who finished third. Midwest’s U16 women’s relay, with Abigal Jarzin, Kelly Koch and Lucy Anderson, racing to first up Mt. Telemark in the relay hill climb at 2016 Junior Nationals in Cable, Wis.
Alaska’s U16 men’s relay, with Luke Jager, Ti Donaldson and Gus Schumacher, racing to first in the hill climb on Saturday at 2016 Junior Nationals in Cable, Wis.
Alaska’s U18 men’s relay, with Hunter Wonders, Canyon Tobin and Tracen Knopp, racing to first in the hill climb relay on the final day of 2016 Junior Nationals in Cable, Wis. The Intermountain U18 women’s relay, with Brook Dunnagan, Anna Gibson and Sofia Shomento, racing to first in the 2016 Junior Nationals hill climb on Saturday in Cable, Wis.
Alaska’s U20 men’s relay racing to first in the 2016 Junior Nationals hill climb, with Max Donaldson, Travis Cooper and Luke Cvoncara. For more photos of the 2016 USSA Junior National Championships, click here! CABLE, Wis. (March 10, 2016) — After hundreds of volunteers gathered at Telemark Trails to shovel snow and restore the course, after a spell of unseasonably warm temperatures Tuesday and Wednesday, the 2016 USSA Junior National Championships freestyle distance races went on successfully on Thursday. Max Lachance (Intermountain) U20, Sophia McDonald (Intermountain) U20, Hunter Wonders (Alaska) U18, Anna Darnell (Alaska) U18, Luke Jager (Alaska) U16 and Sydney Palmer (Intermountain) U16, claimed the Junior National individual freestyle victories. In the U20 men’s 15 k freestyle race, it was a battle for the victory, as first through third were within 3.1 seconds of each other. Lachance edged Max Donaldson (Alaska) by 1.6 seconds to claim the Junior National freestyle distance title. Lewis Nottonson (New England) followed close behind in third, just 3.1 seconds out of first. This is Donaldson’s second podium at the 2016 Junior National Championships, after finishing second in the classic individual start on Monday. The women’s U20 10 k race was another battle to the podium, as first through fifth were within 10.2 seconds of each other. McDonald (Intermountain) edged Abigail Drach (Midwest) by 1.7 seconds, to claim the Junior National freestyle distance title. Mattie Watts (Midwest) followed close behind in third, just 8.7 seconds behind first. This is Drach’s and Watts’ second podium after Drach claimed the Junior National distance classic title on Monday, while Watt finished second overall. The U20 women had to complete three loops around the course, which made up the grueling 10 k.
“It was a hard race with steep uphills and technical downhills, but I really enjoyed racing the 10k skate,” said Drach. In the men’s U18 10 k, Wonders claimed his second Junior National title, after winning the individual classic race on Monday. Wonders skied to a convincing first place finish, 44.1 seconds over Karl Schulz (Mid-Atlantic) and Wyatt Gebhardt (Rocky Mountain) who finished third. The U18 men had to complete three laps of the 3.75k loop. The race felt great, I took it out hot and just tried to hold on,” said Wonders. The U18 women skied an impressive 10 k, as first through third had the three fastest times out of the U18 and U20 women. Darnell (Alaska) grabbed the Junior National individual freestyle title just 0.6 seconds ahead of Hailey Swirburl (Rocky Mountain) and Leah Brams (New England) who finished third. This is both Swirbul and Brams’ second podium at the 2016 Junior National Championships. Brams claimed the Junior National individual classic title on Monday, while Swirbul finished third overall. “I felt great about my race, I focused on having fun and going hard and my coaches killed it with fast skis!” said Darnell. In the U16 men’s 10 k race, new faces were on the podium. Jager (Alaska) claimed the Junior National individual freestyle title 17.3 seconds ahead of James Clinton “JC” Schoonmaker (Far West) and Ti Donaldson (Alaska) who finished third. “This whole season, I’ve been thinking about this race alone,” said Donaldson. “When today finally came, I couldn’t help feeling butterflies in my stomach. However, I forced myself to retain my focus and concentrate on skiing my absolute best. It worked! Also, HUGE shoutout to all of the volunteers who sacrificed their time to work on such an awesome course. In the final race of the day, the U16 women battled to the finish in a tough 5k race. Palmer-Leger (Intermountain) claimed the Junior National individual freestyle title just 3.1 seconds ahead of Novie McCabe (Pacific Northwest) and Margaret Gellert (Alaska) who finished third. Competition continues Friday, with a freestyle sprint. The races will be streamed live, courtesy of Central Cross Country Ski Association (CXC). Bib 159, Sophie McDonald (Intermountain) claimed the U20 Overall Victory. Bib 147, Mattie Watts (Midwest). Bib 243, JC Schoonmaker (Far West). Bib 307, Sydney Palmer-Leger (Intermountain) Skiing to a first-place finish in the Women’s U16 5k. Bib 311, Novie McCabe (Pacific Northwest). Bib 326, Margaret Gellert (Alaska). Warm temperatures and the resulting wet snow has led organizers to push back Wednesday’s races at Junior Nationals in Cable, Wis., and change the formats to a freestyle individual start on Thursday, freestyle sprint on Friday, and potential freestyle relay on Saturday. Junior Nationals opened Monday with 5/10 k classic individual starts. Wednesday’s races were canceled during a coaches’ meeting early Tuesday evening. The wet snow is causing drainage problems on the trails at Telemark and making it difficult to bolster with manmade snow. The stadium is reportedly a puddle, which could force organizers to move the start to a different area and also affect the length of the course loops. On Wednesday, the forecast in Cable called for a high of 37 degrees Fahrenheit with scattered showers. Nick Gardner (Midwest) skiing to a 35-second victory in the U20 men’s 10 k classic individual on Monday, the first day of Junior Nationals in Cable, Wis.
CABLE, Wis. (March 7, 2016) – Warm weather and tough conditions greeted the skiers as the 2016 USSA Junior National Championships kicked off Monday, on the historic and grueling Telemark Trails. Nick Gardner (Midwest) U20, Abigail Drach (Midwest) U20, Hunter Wonders (Alaska) U18, Leah Brams (New England) U18, Mae Chalmers (New England) U16, and Gus Schumacher (Alaska) U16, claimed the coveted 5- and 10-kilometer classic individual Junior National titles. The men’s U20 10k race had first tracks and the coolest temperatures of the day as Gardner (Midwest) skied to a convincing first-place finish 35.1 seconds ahead of Logan Diekmann (Intermountain) who was second and Max Donaldson (Alaska) who finished third. In the men’s U18 10k race, Wonders (Alaska) claimed the Junior National classic title 26 seconds ahead of Nolan Herzog (Rocky Mountain) and Xavier Mansfield (Midwest) who finished third. Wonders also had the fastest time of the day overall on the 10k course. Wonders has had an exceptional year competing in the Winter Youth Olympic Games in Lillehammer, Norway and the U18 Scandinavian Championships in Otepaa, Estonia in February. In the women’s U20 5k race, Drach (Midwest) dominated the race to claim the Junior National classic title 32.5 seconds ahead of Mattie Watts (Midwest) and Lauren Jortberg (New England) who finished third. In the women’s U18 race Brams won the women’s race overall and claimed the Junior National classic title just 4.8 seconds ahead of Mackenzie Rizio (New England) and Hailey Swirbul (Rocky Mountain) who finished third. Brams also had the fastest time of the day for the U20/U18 women’s 5k race. The U16 races became more challenging as the temperature increased, causing the course to become soft. In the men’s 5k race, Schumacher (Alaska) claimed the victory by 6.8 seconds over Ben Ogden (New England) and Conor Munns (New England) who finished third. In the women’s U16 5k, Chalmers (New England) claimed the Junior National individual classic title just 3.9 seconds over teammate Anna Lehmann and Abigail Jarzin (Midwest) who finished third. Competition continues Wednesday with a 1.3/1.0k classic sprint. The races will be streamed live, courtesy of Central Cross Country Ski Association (CXC). Bib 194, Abbie Drach (Midwest) claimed the U20 Female Victory in a 5k Individual Classic. Bib 36, Hunter Wonders (Alaska) claimed the U18 and Overall Victory. Bib 284, Mae Chalmers (New England) Won the U16 Women’s 5k Race. Bib 343, Gus Schumacher claimed the U16 men’s 5k Classic Victory.